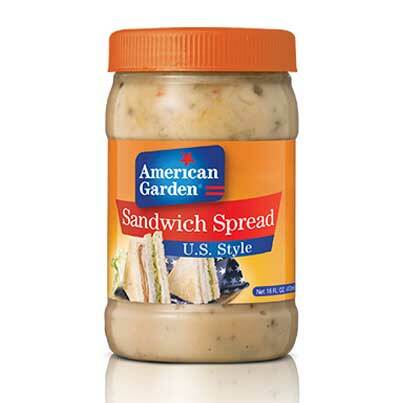 Our American Garden sandwich spread is a great way to add some flavor to all your on-the-go snacks. A small dollop spread on your turkey and cheese sandwich is more than enough to upgrade its taste in just seconds. 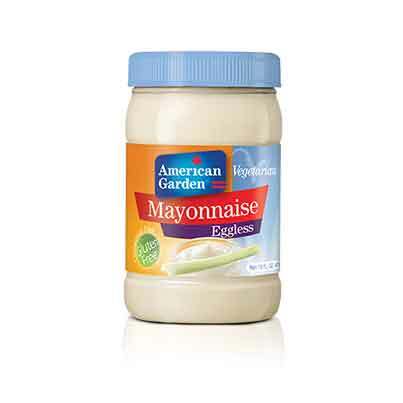 All children will enjoy the authentic taste of our American Sandwich spread. Add it to your birthday, picnic and gatherings wraps! Available sizes: 8oz, 16 oz. 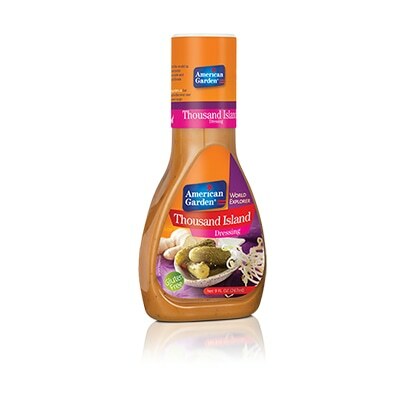 American Garden’s Thousand Island Lite dressing offers you the same authentic taste, but with 50% less fat and 33% fewer calories. Traditionally used as a salad dressing, its rich texture also allows serving it as a dip next to crunchy samosas, as a spread on your sandwiches and burgers, or mixed in with prawns for a prawn cocktail. 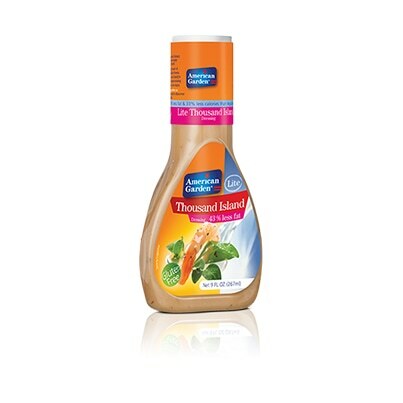 A splash of American Garden Thousand Island Dressing adds a zing into your favorite salads. This staple condiment, sometimes referred to as “cocktail sauce” in some Arabic countries, is usually served as a dressing for sea food salads, or as a dip next to breaded appetizers, French fries and raw vegetables. Try it on your favorite sandwiches and burgers as well. Lip-smacking! Are you a fan of rich ranch dressing, but trying to reduce your daily fat intake – and eventually calories? We have all you need! 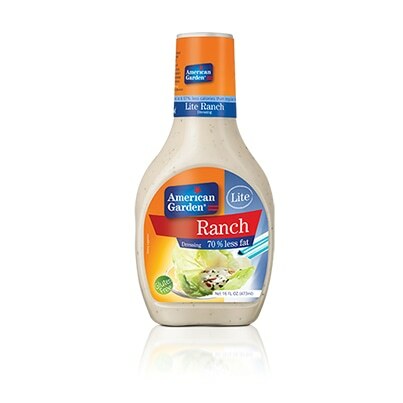 American Garden Lite Ranch Dressing is your best choice for a salad, as it has 70% less fat than the ordinary ranch dressing. Don’t hesitate to use it as a delicious dipping sauce as well, for light daily snacks and boring raw veggies. 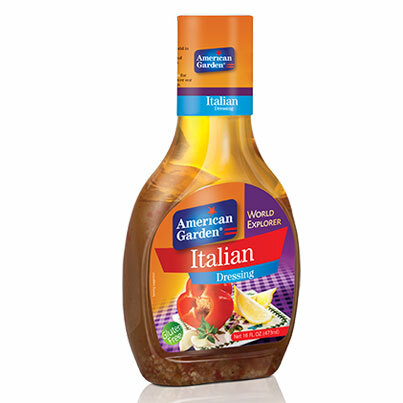 American Garden Italian dressing contains all the ingredients you need to make your salad recipes exquisite! With its rich texture and taste, this product can be used as a marinade, a dipping sauce and a seasoning for all your savory meals. The combination of vegetable oil with garlic, vinegar and spices gives this Italian dressing a well-balanced flavor, making it a great complement to your favorite dishes. 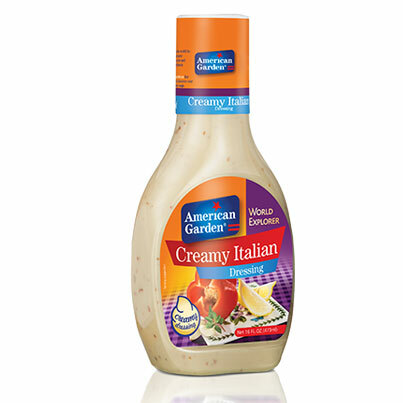 American Garden Creamy Italian Dressing is made with natural ingredients that enhance its flavor and make it a perfect match to your salads. But why limit yourself to this choice only, when you can serve it as a dip as well, next to your raw veggies or fried appetizers such as samosas and cheese rolls, and even use it as a marinade for your grilled chicken and meats? 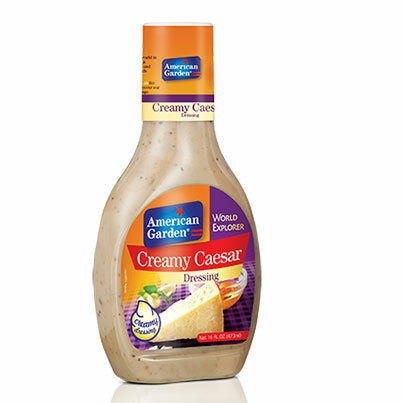 Whether you’re opting for a Classic Caesar, a Chicken a or Shrimp Caesar salad, choose this American Caesar dressing for its creamy texture and perfect taste. 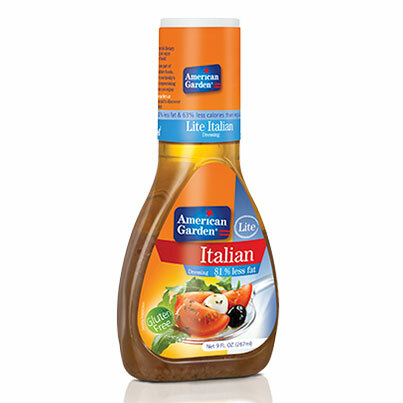 Our gluten-free vegetarian American Garden Lite Italian dressing has only 30 calories per serving, so it’s an ideal option whether you are on diet or trying to cook & eat healthy. A splash of this Lite Italian dressing will turn even the dullest salad into a delightful treat. But do not limit yourself to veggies, as this product can be added to marinades or enjoyed as a dip. 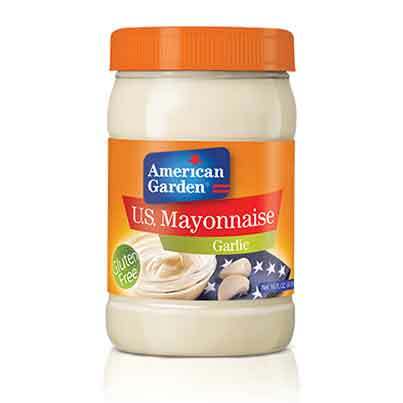 Perfect as a salad dressing, but also as a dip for your vegetables and deep fried zuccini sticks, American Garden Creamy Ranch Dressing always offers you an exquisite culinary experience. Made with the finest ingredients, this product tastes even better than homemade with its creamy texture and rich tangy taste. 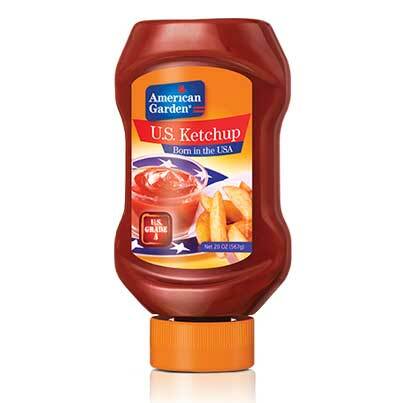 Add an extra kick to your burgers, nuggets or fries with American Garden Hot N Spicy Ketchup. Made from California vine-ripened tomatoes, and Certified US Grade A our Hot and spicy ketchup will wake up any dish and give it that perfect little splash of spice! 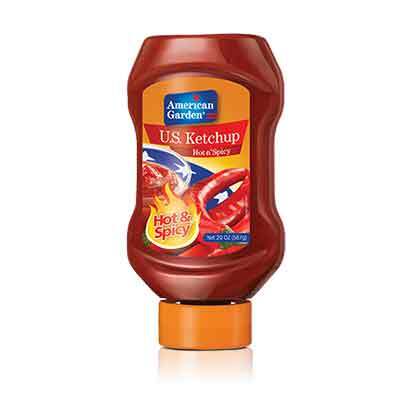 Americans have a long-standing love affair with Ketchup- no meal is complete without it! Made from California vine-ripened tomatoes, and Certified US Grade A our ketchup recipe combines a balanced blend of spices to make a sweet and tangy sauce that is the perfect accompaniment to any dish. We seal in all the delicious tomato flavor till it makes its way on to your fries, burgers or sandwiches. Sizes available: 15oz, 20oz, 24oz, 36oz, 64oz. 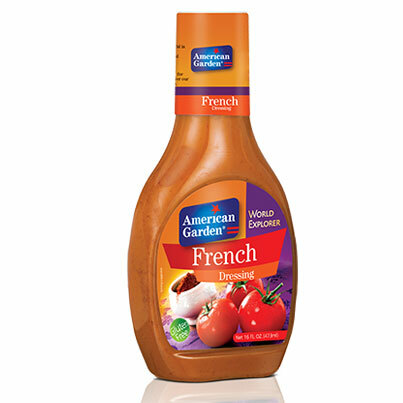 Add a splash of boldness to your favorite dishes with American Garden Spicy brown Mustard. You can add kick of flavor that goes beyond our classic yellow mustard. 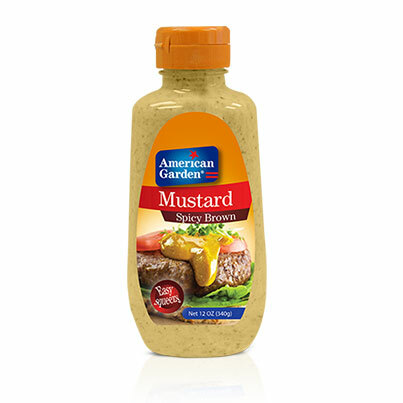 From hotdogs & sandwiches to Burgers and nuggets make everything extraordinary with a swirl of our spicy brown mustard. 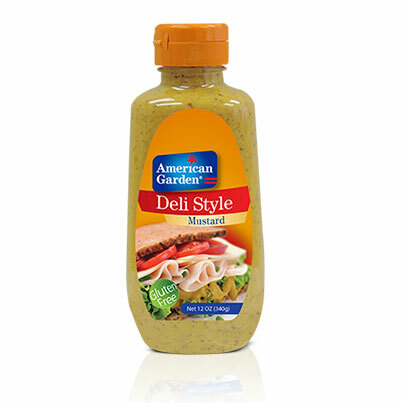 With American Garden Deli style mustard you can create gourmet sandwiches at home. Made from US #1 grade mustard seeds our Deli style Mustard is the perfect finishing touch to a sandwich or as a dip for meat. 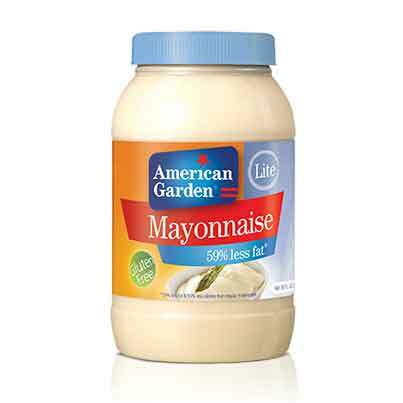 Made with # 1 grade mustard seeds, American Garden Yellow mustard is the Number 1 seller in many markets. Thanks to its tangy taste, soft consistency and versatility, our classic yellow mustard is a preferred choice. Naturally fat-free and low in sugar, it’s also a tasty option for the health-conscious. 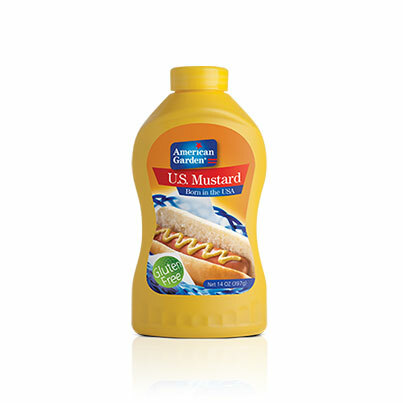 Our Squeezable yellow Mustard is the perfect partner to hot dogs, sandwiches and burgers- at baseball games or in the house. But don’t just stop there- squeeze some on a shawarma or kebab rolls. Flavored with honey, this American classic recipe is guaranteed to satisfy all your cravings! If you enjoy a hint of sweetness, use it as a marinade for your chicken or on top of your steak next time you have a barbecue. And for lazier days, it is just perfect for TV snack sessions. Serve it as a dip next to your fries or mozzarella sticks and Enjoy! 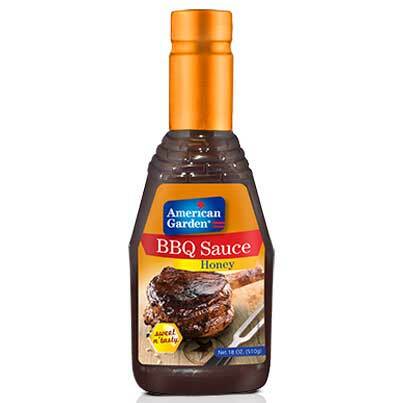 American Garden Hickory BBQ Sauce uses an authentic American recipe distinguished by a sweet smoky flavor that will enhance all your meats! Use it to marinate your chicken or pour it on top of ribs, steaks and sausages while they’re still on the grill. And did you know that you can use it as a dipping sauce? Serve it next to chicken tenders or potato balls and enjoy a unique taste. 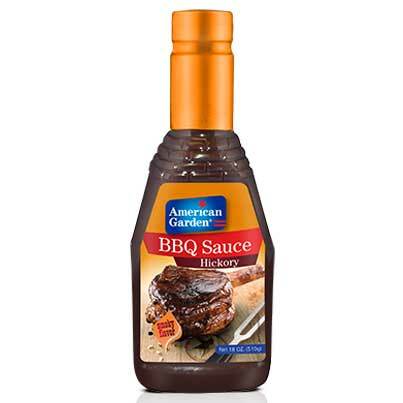 A great American Classic, our BBQ Original Sauce uses an authentic American recipe to ensure the best taste for any backyard barbecue or TV snack session! Enjoy this gourmet-quality sauce as a marinade for your chicken and meats before laying them on your grill, or try it as a dip on the side of your favorite appetizers. Your chicken nuggets never tasted that good before! 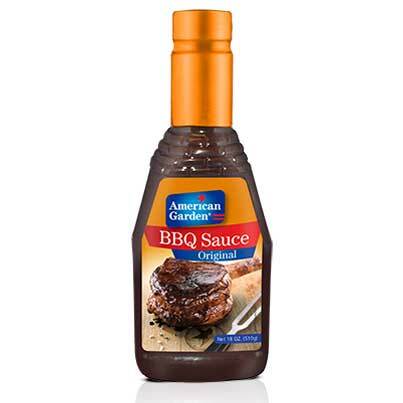 Complementing the great tradition of barbecues enjoyed around the globe, American Garden Steak Sauce has a unique flavor that makes it a grill favorite. Commonly served as a condiment for beef, its unique taste will add a spin to your dishes and will motivate you to create more delicious recipes. Cooking has never been this much fun! If you’re looking to add a kick of flavor to your dishes, we have the product you need! 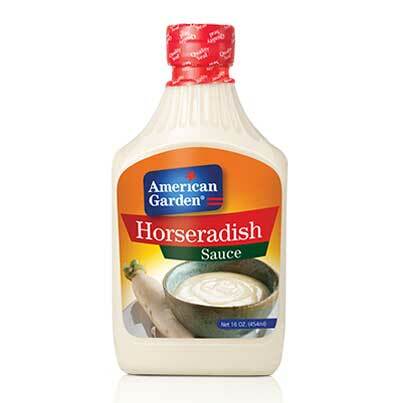 Try American Garden’s Horseradish Sauce: a tangy condiment that guarantees a distinct and enjoyable taste. It is traditionally served with roasted meats such as ribs or roast beef, but we suggest you try it in your sandwiches and salads’ dressings as well, or as a dip next to your veggies. 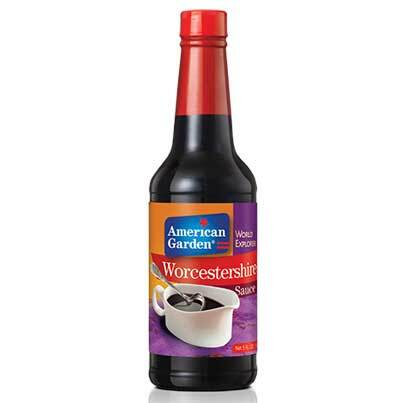 A classic favorite when it comes to meat and fish recipes, American Garden Worcestershire Sauce is a pantry must-have that never fails to deliver a bold splash of flavor. Traditionally used in Caesar dressing and in burger patties, it can also be added to stews, soups, casseroles and marinades. It’s also used as an alternative to Soy Sauce or fish sauce. It has a spicy strong flavor, so use it in small quantities. 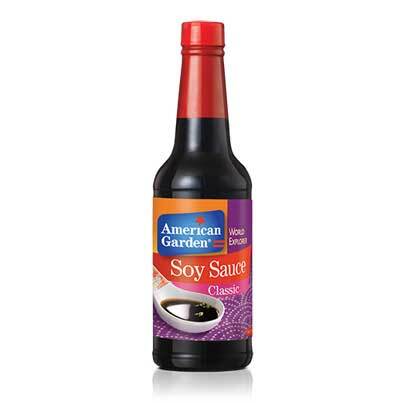 Enjoy the best of the Asian flavors no matter where you are with American Garden Soy Sauce. This staple condiment can be served as a dipping sauce to enhance the flavor of your favorite appetizers: spring rolls, dumplings and sushi rolls never tasted better. It can also be used as an ingredient in stir-fries, stews or marinades. And finally, a small tip: it gives your veggies an exquisite taste when added to salads’ dressings! 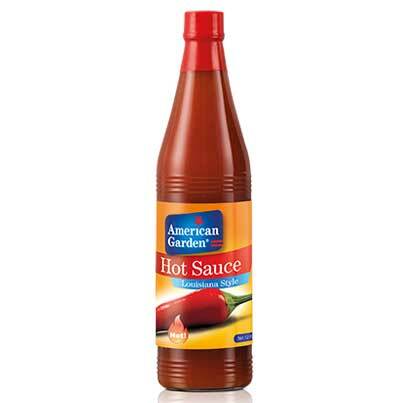 This American Garden Hot Sauce is prepared with premium quality aged red chili peppers and natural vinegar. Add an extra kick to your sauces, seasonings and marinades using a drop or 2 of this Louisiana chilli sauce! Your chicken wings, homemade dips and salads dressings never tasted better! Available sizes: 3FL.oz, 6FL.oz, 12 FL.oz, 16FL.oz. 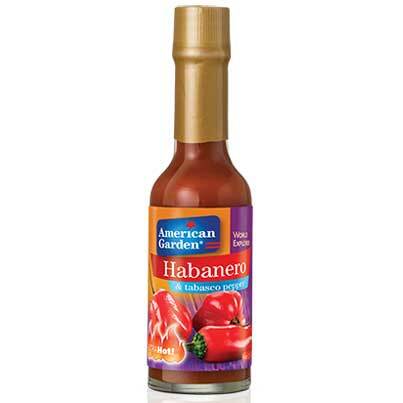 American Garden Habanero Sauce will stimulate your senses and your appetite like no other product! Created with the finest aged red chili peppers and natural vinegar, this condiment is everything you need to add an extra kick to your favorite hot recipes. Your dips and sauces were never this good, and your meatballs will taste so much better with a bit of this unique sauce! 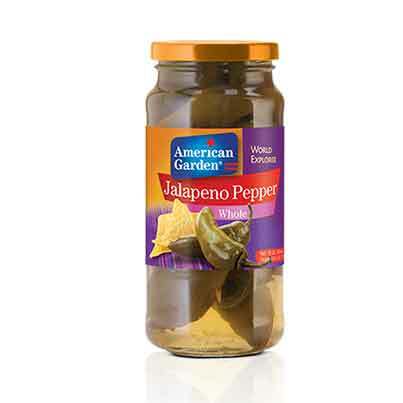 Spice up your favorite recipes with American Garden’s famous jalapenos! Perfectly sliced for your convenience, our Mexican peppers can be directly tossed in your salads or added to your taco mixture. They are also delicious with fajitas and enchiladas. No matter how you use them, they will guarantee an exquisite taste that will please everybody! Are you a fan of hot Mexican foods? 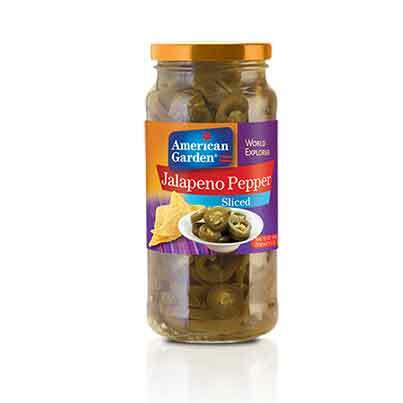 American Garden Whole Jalapeno Peppers will surely suit your taste then! A great accompaniment to your tacos, fajitas and quesadillas, our jalapenos are guaranteed to spice up all your Mexican dishes. This product can be also used for a large variety of other recipes, such as burgers, sandwiches and salads! 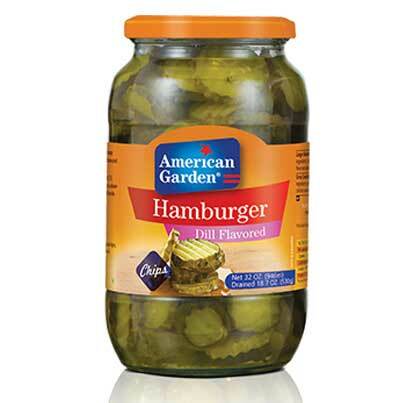 American Garden Hamburger Dill Flavored-Chips add a splash of flavor to your burgers. Chopped to your convenience, they can also be added to your favorite sandwiches like hot dogs or even to salads. Famous for both their taste and crispness, you don’t want to forget them on your next picnic or family barbecue! 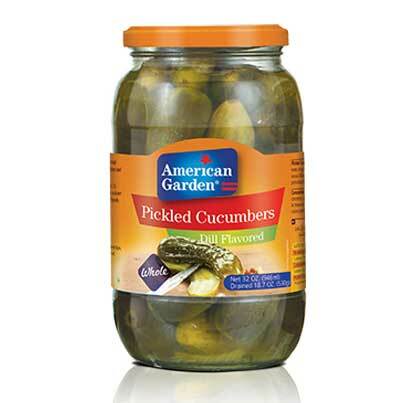 American Garden offers you its fresh pickles flavored with dill! Crunchy and tasty, you can serve them with your burgers, salads and snacks. You can also add them to your sandwiches or even chop them to garnish your favorite savory meals! 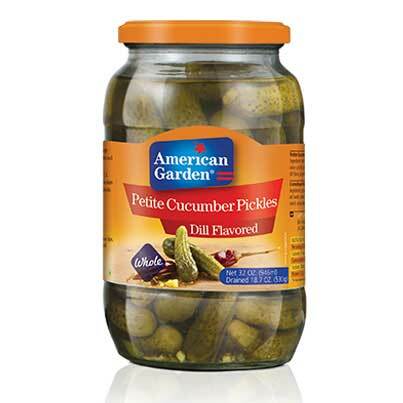 American Garden Petite Dill Pickles are simply the best! Crunchy with a hint of vinegar and salt, they will surely suit a large variety of salads. They can also be used to prepare tartar sauce or to add crunchiness to your favorite sandwiches. And for your gatherings, they will add a nice touch to your cheese and cold cuts platters! 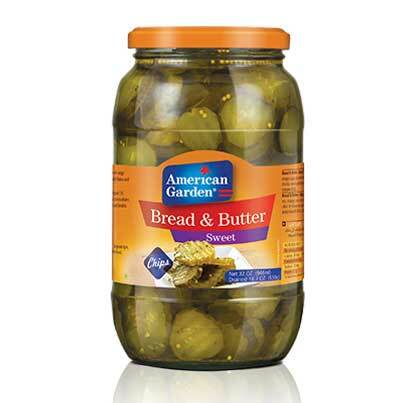 Sweet pickle lovers will fall for American Garden Bread and Butter Chips! Our cucumbers are perfectly sliced and pickled in our special brine to be easily used in various recipes, from salads to sandwiches and especially burgers. Usually enjoyed for their great taste and crunch, you can also serve them alone as healthy snacks or starters! 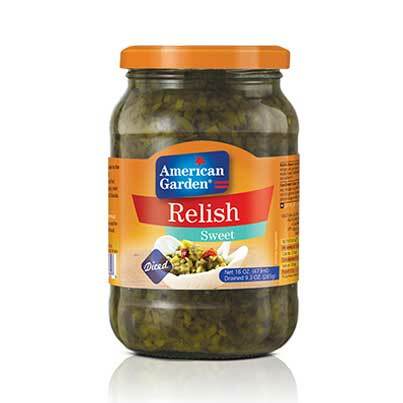 Enhance the taste of your recipes by using American Garden Sweet Relish, a high-quality product made with finely diced cucumbers that are pickled in our special brine. 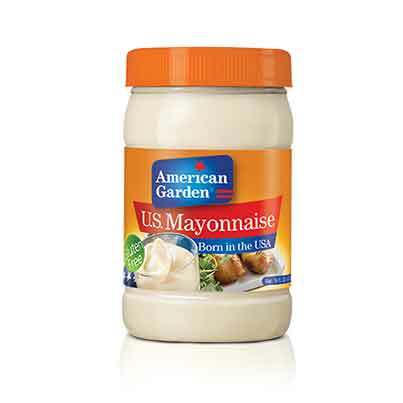 Use it also to prepare an effortless tartar sauce, or add a few tablespoons to your potato and pasta salads. Available sizes: 454g, 907g, 1.93Kg. 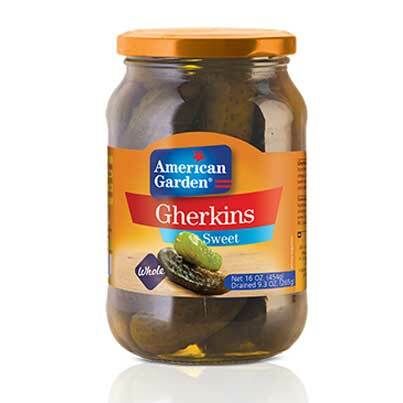 American Garden Sweet Gherkins taste better than homemade, and they are full of flavor. Moderately salty and vinegary with a crunchy texture, these condiments can be enjoyed alone as a starter, or in a bunch of recipes such as chicken or club sandwiches and pasta or potato salads. They are also delicious when served next to foul moudammas or balila! They are also a great topping for pizzas, sandwiches and salads. And what about chopping them to make a delicious tapenade? It will taste wonderful with fresh homemade bread! Whether you are planning to enjoy a mouthwatering labneh sandwich or a delicious thyme pie – more commonly named manoushe in the region – for your breakfast, do not hesitate to add some delicious American Garden Whole Black Olives to it. But that’s not all. This condiment is also considered an essential part of the Lebanese mezze, usually served along pickles, and it can be added to your favorite salads and pizzas as well. 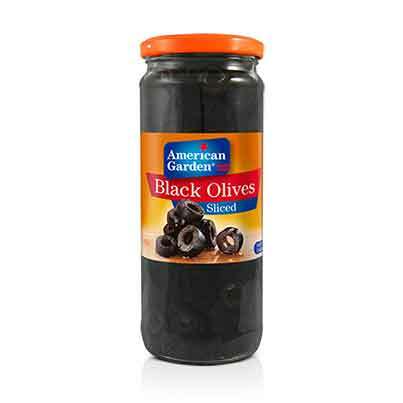 American Garden Black Sliced Olives are your perfect choice to add flavor to pasta sauces and sandwiches. They are also good to go ontop of a pizza, salad, or the perfect plate of nachos. Carefully pitted and sliced, they’re a time-saver, so always keep them in your pantry to give your cooking that Mediterranean touch! 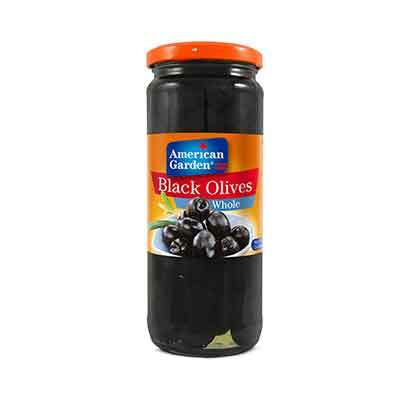 American Garden Black Pitted Olives are carefully picked to be of the highest quality in order to release an explosion of flavor that everyone will enjoy. Black olives stay longer on the tree, giving them the deeper colour, and less bitter taste than their green cousins. Pitted for your convenience, they add the perfect final touch to a colorful salad prepared to be enjoyed over lunch with your family, or to a delicious pizza served to your friends during special gatherings and movie nights. 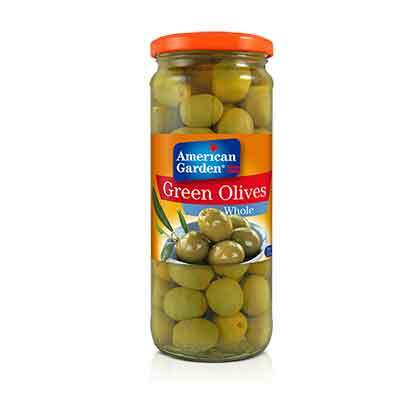 Carefully picked, American garden green olives will guarantee a great culinary experience! They are perfectly sliced and drained to be quickly and easily used in all your savory recipes! Serve them as appetizers with a squeeze of lemon juice for your casual family dinners or just toss them with your bread dough while baking! You can also chop them for a delicious tapenade! 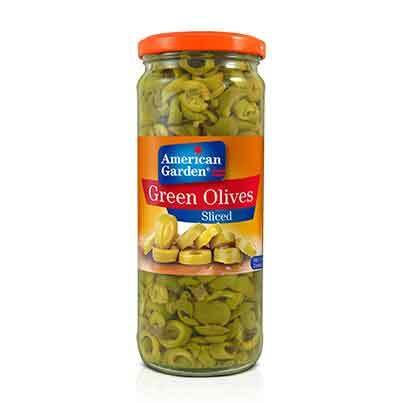 American Garden Stuffed Green Olives are perfect to serve to your guests as tapas or mezzes. They can also be used to prepare some wholesome yet tasty salads, pasta dishes, pizzas and appetizers. This high-quality product aims, like all our other products, to please our customers. This is why we pick the highest quality olives in order to excite your taste buds and release an explosion of flavors in your mouth. 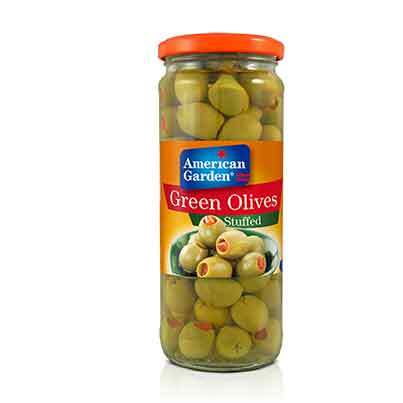 American Garden Whole Green Olives are chosen with care to please everybody! Serve them with a wide variety of pickles on your mezze table, or as a stand-alone starter with hot bread. And what about adding them to your labneh sandwich, with some fresh mint and tomato slices? It’s definitely the perfect combo breakfast to start an energetic day for your whole family! 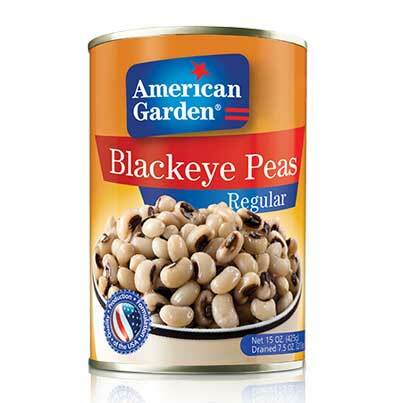 American Garden Black Eye Peas can be eaten straight from the can. Delicious in casseroles and soups, they also taste great in salads, especially quinoa salads. Perfect for last-minute lunches or dinners, this high-quality product should always be kept at hand for emergencies! 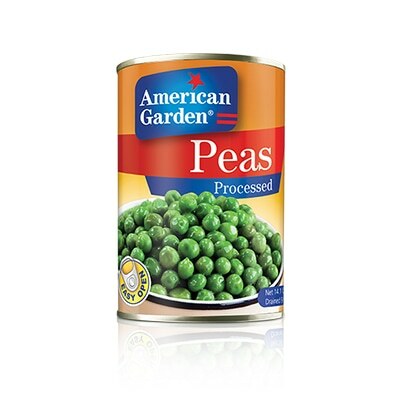 American garden processed peas are preserved in a way to keep their fresh color and their sweet taste. Full of flavor, they are ideal to prepare a fresh vegetable soup, a meat stew or a stir-fried rice. And for a unique appetizer, try mashing them with a bunch of mint leaves and a garlic clove then serve them with crackers. Delicious! American Garden Cut Green Beans taste just like fresh, and they save you some precious time because they are ready to use straight away. Sauté them in butter to get a delicious side that you can serve next to your steaks or use them in your favorite soups and stews. You can add them to your favorite salads as well! A classic Nicoise is always a good option for a last-minute dinner. 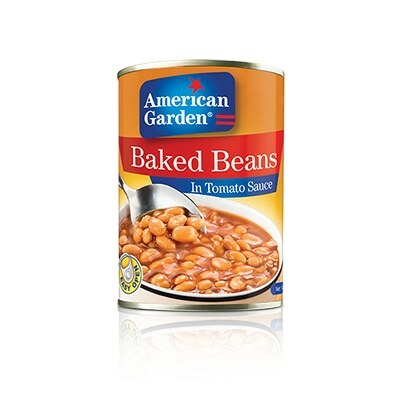 American Garden Baked Beans are cooked in a sweet flavorful tomato sauce. Thanks to their easy-open lid, you can take them anywhere for a snack during your weekend brunches or picnics! A convenient staple enjoyed around the world, you only need to reheat the beans before serving for an English style breakfast, next to hot dogs and sunny side-up eggs. You can also enjoy them as an easy side, next to your favorite meats. 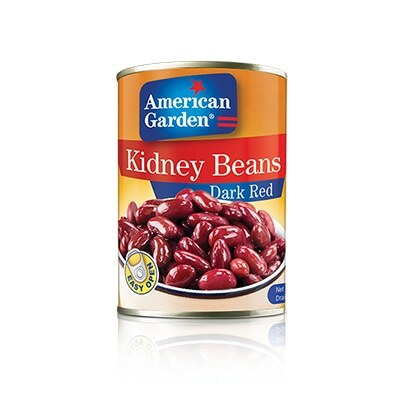 American Garden Red Kidney Beans are a high quality product. Pre-cooked, they will save you some precious time in the kitchen. No matter how you’re planning to use them, they will surely please everyone. Added to hot or cold recipes, they always guarantee a great taste! Try them when preparing the famous chili Mexican soup, or just mix them with other beans for a delicious colorful salad. 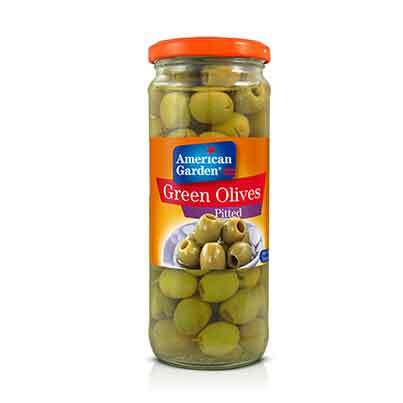 American Garden offers this Middle Eastern favorite, in a convenient ‘easy open’ packaging that’s perfect for picnics and indoor cooking. Whether you want to cook your fava beans in a tomato sauce and serve them with sunny side-up eggs, or if you’re willing to go for more traditional sauces, like the Lebanese or the Egyptian ones, this product is for you. And why don’t you try to puree your beans and mix them with some tahini and lemon juice? You’ll get an appetizer that is guaranteed to please! Are you a fan of Lebanese cuisine? 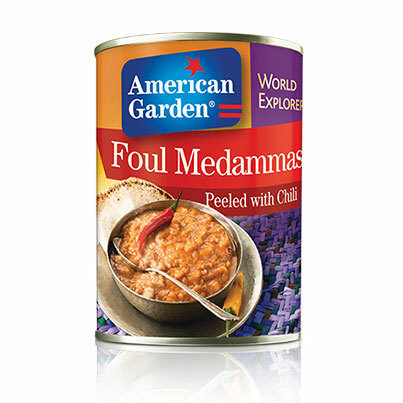 American Garden canned foul medammas will definitely please you! 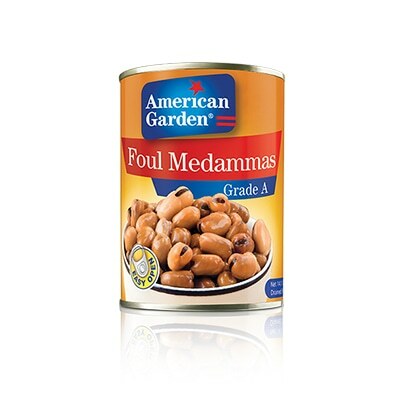 Made with natural ingredients, this classic foul medammas recipe combines chickpeas with fava beans to be served as mezze on your table! And for an enhanced taste, you can add a clove of mashed garlic! American Garden Foul Peeled Chili consists of peeled fava beans that were cooked with tomato paste and a special spices mixture, and flavored with chili! 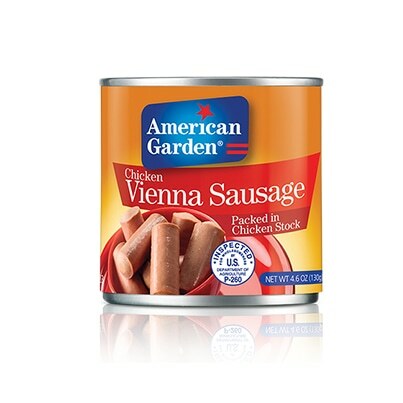 Ready to eat, this product is perfect for a hearty breakfast or appetizer! They are best served with pita bread, fresh mint and onions. 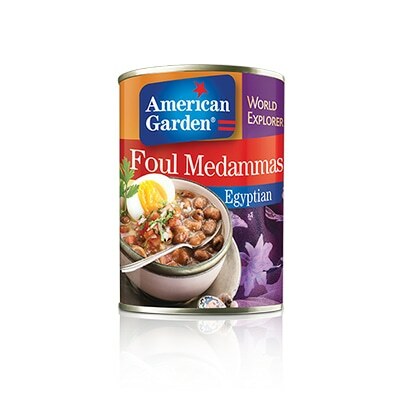 American Garden brings you Egypt’s most famous street food to the comfort of your home. Try our stewed fava beans, seasoned with lemon juice and a special spices mixture, for breakfast or as an appetizer. Their ‘easy open’ packaging makes them convenient to use at any time! 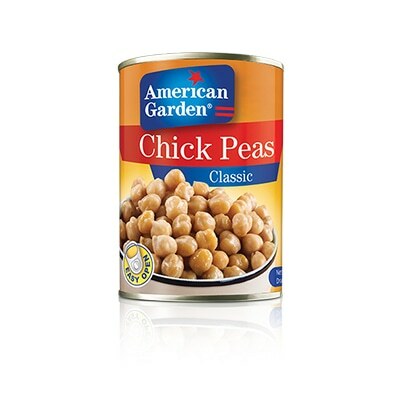 American Garden’s classic chickpeas are convenient to use at any time! Their “easy open” packaging makes them perfect for all occasions: whether you’re cooking at home or outside, they will always be at hand! Use them to prepare in no time a large variety of your favorite dishes such as couscous, balila, falafel, salads or soups. You can also puree them to get the famous hummus! 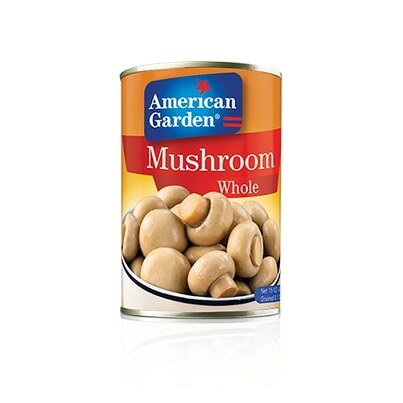 American Garden Whole Mushrooms are picked and chosen with care, and then canned in natural ingredients to preserve their authentic flavor. They are perfect to use in various dishes: add them to your veggies in salads and soups or sauté them in butter, cream and garlic for a delicious side dish to serve next to your steaks. You can also marinate them with your chicken cubes for a delicious taouk platter or add them to your favorite curries and stews. 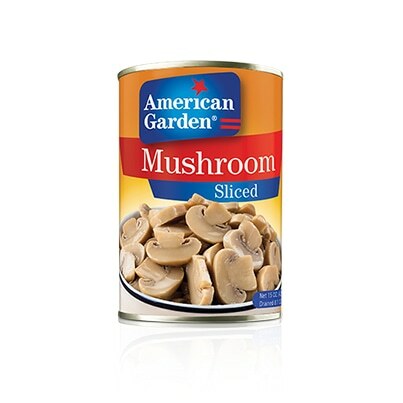 American Garden Sliced Mushrooms are picked with care and canned in natural ingredients to preserve an authentic flavor. They are delicious on top of your pizzas. 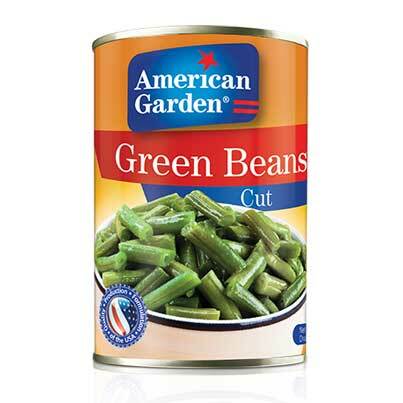 Suitable also for soups or salads, American Garden always guarantees the best vegetables quality! 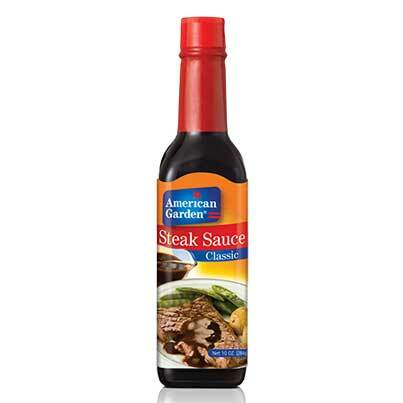 A convenient option for all your savory dishes, they can be sautéed with cream for a great taste sauce to accompany your steaks or burgers! 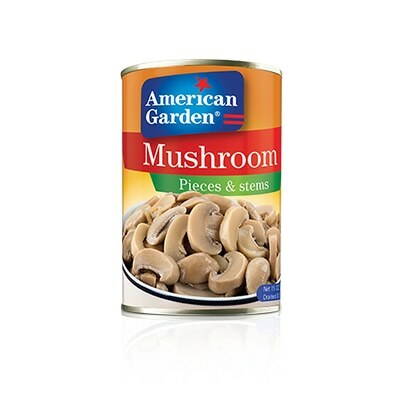 Picked and chosen with care, American Garden Mushrooms Pieces and Stems are canned in natural ingredients to preserve their authentic flavor. Whether cooked or not, they will taste great in any savory dish. Used in salads, atop of pizzas, in pasta sauces or beside your chicken and beef steaks, they will definitely please everyone. 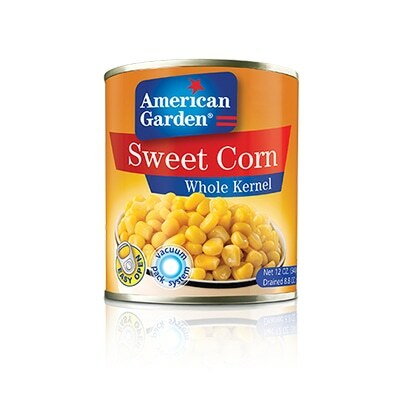 American Garden whole kernel sweet corns are vacuum packed to preserve their quality and their freshness. They are conserved in water and salt only with no preservatives to keep the same genuine taste. Toss them in your salad or just sautee them beside your steaks, they are delicious! You can also add them to your pasta dishes and rice casseroles for a change! 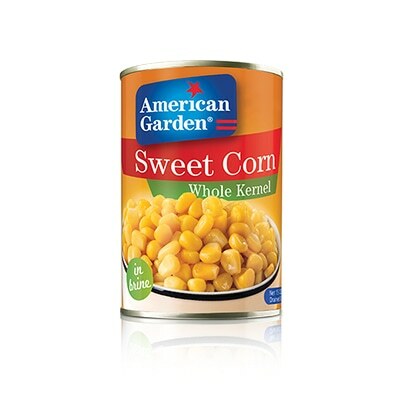 Suitable for a wide range of recipes, American Garden whole kernel sweet corn is all you need in your kitchen pantry! These high fiber grains can be served sauteed with other vegtables in side dishes or added to your favorite salad! And for more conveniency, they are available in an easy open can so you can directly add them to your dish! 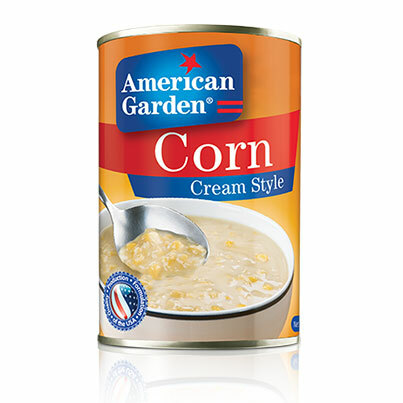 With a little water, you can turn American Garden Cream Style Corn into a tasty bowl of soup, or you can heat it and serve it as a side dish or a sauce next to your main courses – specially chicken and meat dishes. Made from high-quality pureed corn kernels, this product is so easy to use. 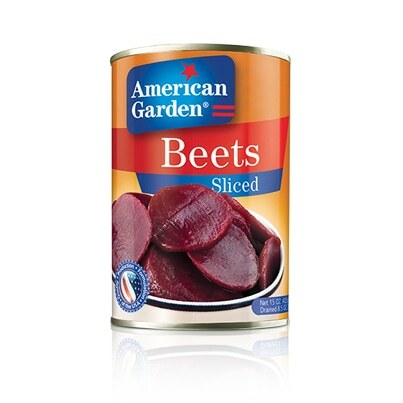 All your favorite vegetables are in one can. 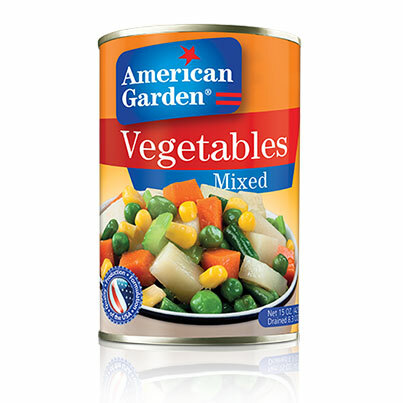 Picked at the height of ripeness then quickly sealed and preserved to retain their freshness, American Garden Mixed Vegetables are delicious and nutritious. They are perfect for a quick side dish or to use in an easy casserole or soup. Upgrade your salads with these colorful beet slices that taste as good as fresh ones! Pre-cooked, they are ready to top your greens on a side salad at anytime. And if you’re going for a more fulfilling main course salad, you can add some quinoa or couscous, in addition to proteins: boiled eggs, crab sticks or cheese… Your options are unlimited! 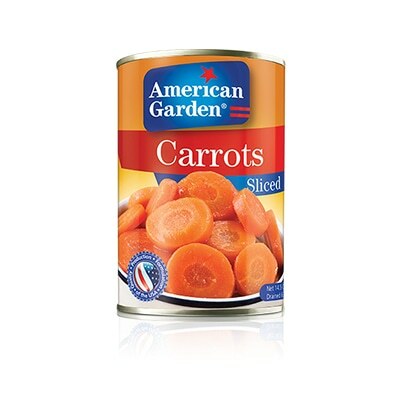 American Garden Sliced Carrots are perfect to be added to your soups and stews. Ready to use from can, they will help you save time in your kitchen. Nutritious and convenient for any kind of dish, their freshness is always guaranteed. 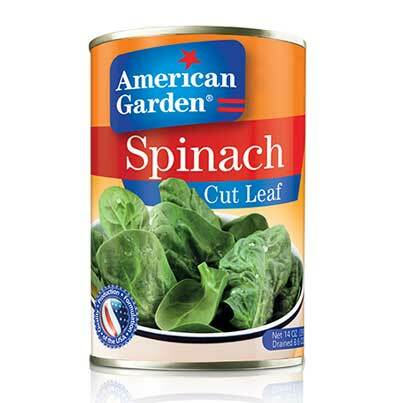 American Garden’s canned Spinach leaves are sealed and preserved at their peak of freshness to ensure that they taste just as delicious by the time they make it into your lunch or dinner. Never skip this super food anymore when preparing your lasagnas, pastas, stews, soups and curries: opt instead for American Garden’s Cut Leaf Spinach. A long time Mediterranean and Middle Eastern favorite, American Garden carefully selects Grape leaves to ensure the freshest picks for meals. Try them with a meat and rice stuffing, cooked with lamb ribs for a maximum taste. And if you want a lighter option, have them as appetizers, stuffed with a vegetarian mixture of rice, tomato and herbs. Everyone will just love them! Are you a fan of the delicious Turkish dolma dish? 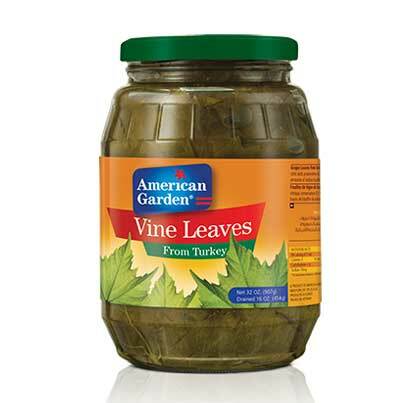 Then, you must use American Garden drained Turkish grape leaves! They are chosen from our best quality vineyards in Turkey to ensure the freshest picks for meals! 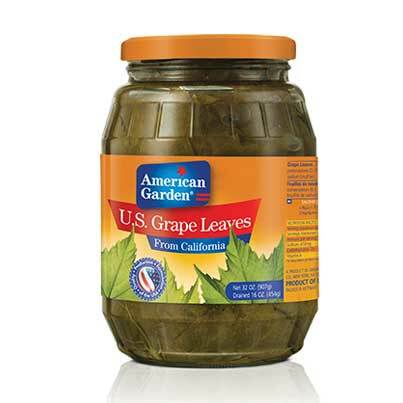 Perfect in size and well packed for convenient use, these leaves will turn incredibly soft and terribly delicious when cooked! Looking for a quick and easy recipe for lunch or dinner? Why don’t you try our American Garden Corned Beef? Just crumble the beef in a pan and fry until browned! For a better taste, you can add your favorite chopped vegetables and a squeeze of lemon! 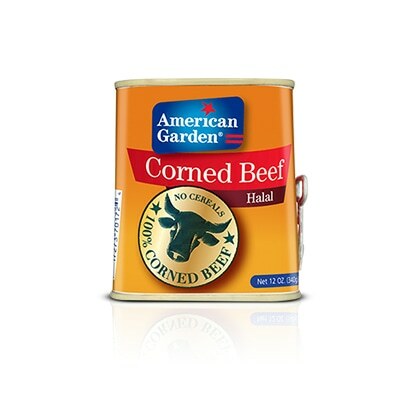 American Garden corned beef is perfect for sandwich lovers! 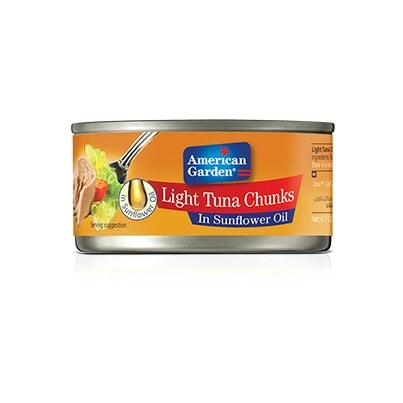 Add a little twist to your recipes with American Garden Light Meat Tuna Chunks! Use them on top of your favorite homemade pizza, or just mix them into your pasta sauce! Our Tuna is carefully sourced to ensure consistent quality, and it’s preserved in sunflower oil that will guarantee a great taste! No matter how you use it, in snack-style bites or more elaborate recipes, our light meat tuna will surely please everybody! Preserved in natural spring water, our tuna is a perfect healthy choice for all your favorite dishes. 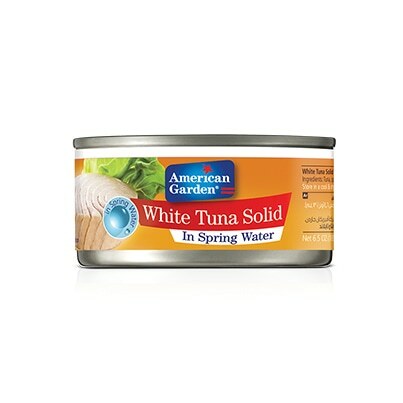 American Garden’s White Solid Tuna in Spring Water adds a great taste to your salads and sandwiches. It can also be a good substitution for meats and chicken in some traditional Arabic dishes like Kabsa or Majboos. 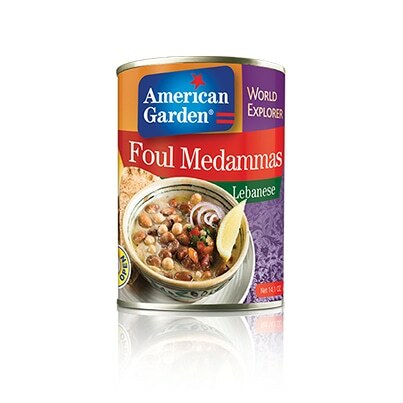 And for a light dinner, you can enjoy this product on its own, with a squeeze of lemon juice and some pita bread. 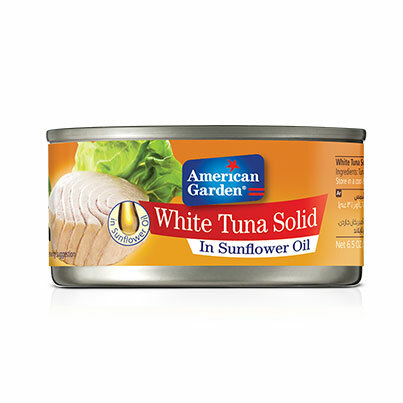 American Garden White Solid Tuna in Sunflower Oil is the must-have product in your pantry! Use it for tasty snack-style bites that all your family will enjoy, or add it to your veggies for a main dish-salad. And if you’re feeling more adventurous, you can try some more elaborate recipes: replace the meat or chicken in your traditional rice dishes with tuna, for a delicious kabsa or majboos that will soon become a family favorite! 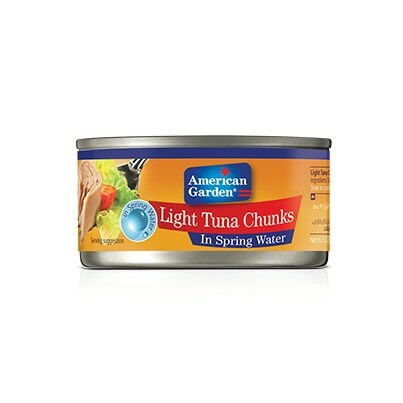 Packed in spring water to preserve the authentic taste of the fish, American Garden Light Meat Tuna Flakes will taste great in all your appetizers and salads, and a top of your pizzas! And when in a hurry, you can have it as a quick fulfilling snack with a squeeze of lemon juice on a slice of toasted bread or crackers. 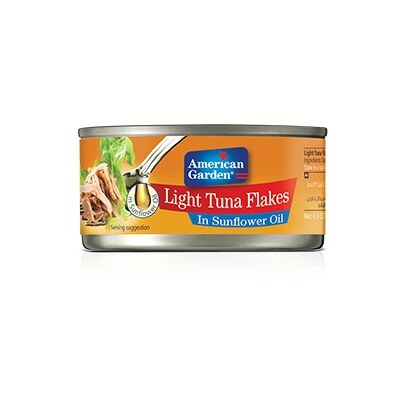 American Garden Light Meat Tuna Flakes in Sunflower Oil are perfect to enjoy for a quick lunch or dinner with a simple lemon squeeze, some toasted bread and a few pickles. But they can also be added to your favorite salads, casseroles and pasta sauces. And if you’re craving deep-fried foods, what about preparing some tuna croquettes? They are delicious! 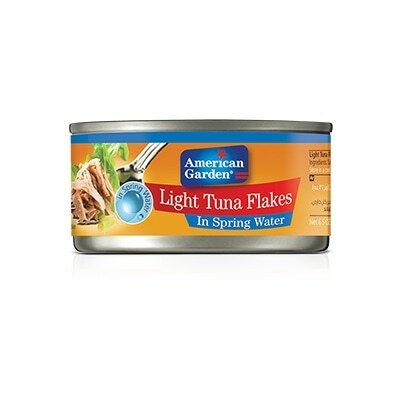 American Garden Light Tuna Flakes in Spring Water allows you to enjoy the same premium fish quality, in smaller pieces and with a less calorie intake. Mix them with your favorite vegetables and a mustard or mayo-based dressing for a healthy fulfilling salad, or serve them on a crusty bread with your favorite vegetables. 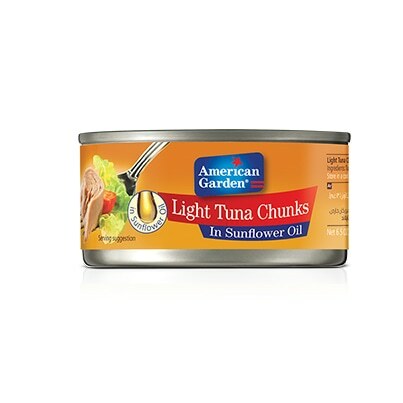 A worldwide classic, American Garden Canned Light Meat Tuna Chunks in Sunflower Oil is carefully sourced to ensure consistent quality and taste from snack-style bites to elaborate recipes. Try it in light sandwiches with some mustard and pickles then add the veggies of your choice, or add it to your favorite salads such as Nicoise. 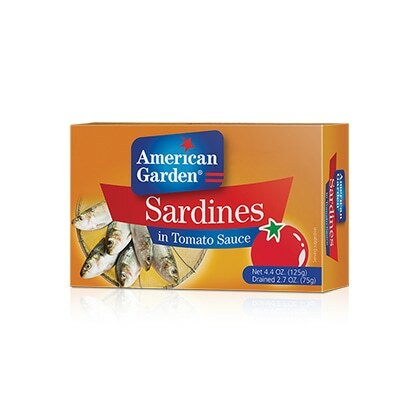 If you’re looking for the quickest meal to fill your hunger, try American Garden sardines preserved in tomato sauce! The combination is just great to eat with a bread slice or make it a part of your main course! Try it with spaghettis or rice for a fulfilling dinner or lunch! It’s convenient for any meal! 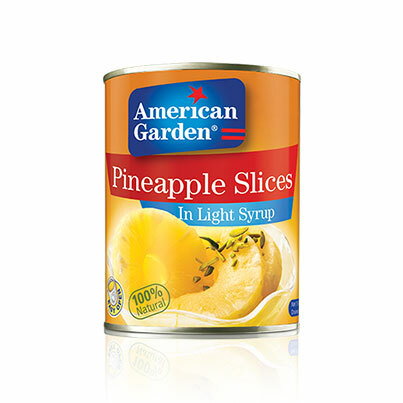 Add lightness to your desserts by topping them with American Garden’s delicious pineapple slices. 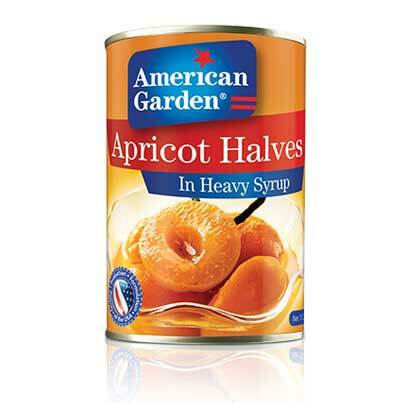 Prepare the best pies, cupcakes and upside-down cakes in town with these tasty fruits canned in light syrup. Use them also for cooking: they taste great with sweet & sour dishes as well as curries. There will always be special dishes that suit everyone’s mood! 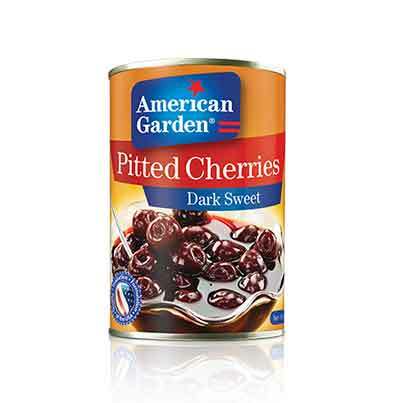 American Garden dark sweet cherries are canned at their peak sweetness. They are then pitted for your convenience! Enjoy them in yogurt, pies and muffins, or as a topping to your pancakes and waffles. And if you’re looking for a way to beat that summer’s heat, they’re perfect in drinks too! Just add them to your favorite smoothies or milkshakes. For your convenience, we have picked all your favorite fruits and preserved them at the peak of freshness so they are at the tip of your hand anytime. 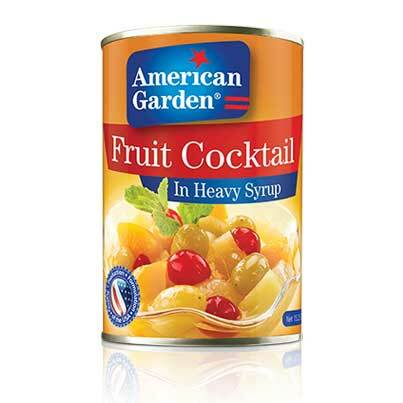 Use American Garden Fruit Cocktail in Heavy Syrup to stuff your cakes and pies, to enhance your fruit salads or to decorate your favorite cheesecakes and other desserts! Sizes available: 8.75oz, 15.25oz, 30oz. 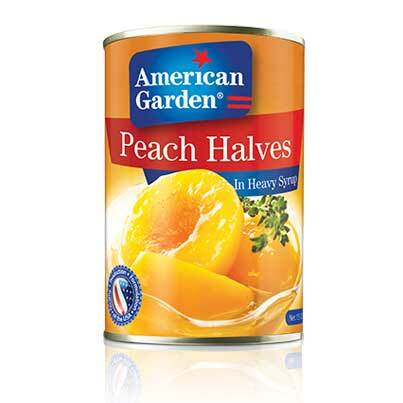 Have you tried American Garden Canned Apricot Halves? Our fruits are always handled with care to guarantee the best-quality fruits to be used in desserts or offered as quick ready snacks. Perfect in upside-down cakes, tarts and cheesecakes, they also add a nice touch to your summer fruit salads, refreshing sundaes, fruity smoothies and old-fashioned milkshakes. 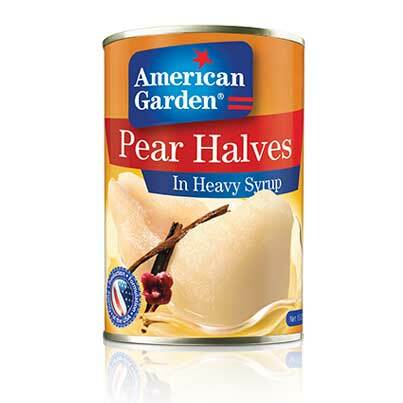 Crisp ripe pears are canned in heavy syrup to be available at hand all year round. They can be enjoyed alone as a snack, or added as an ingredient to different desserts: fruit salads, cakes, pies… And for advanced cooks, you can try adding American Garden Pear Halves to your tagines, curries or stews. Ripe juicy peaches are carefully selected and packed fresh in heavy syrup for maximum flavor. Cut in half for more convenience, you can use them directly from the can as a refreshing snack, or you can add them to your favorite salads, yogurts and desserts. 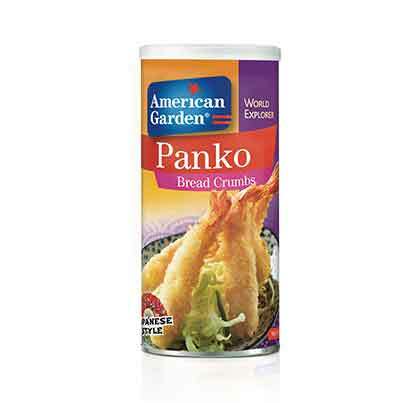 American Garden Panko Style Breadcrumbs gives your shrimp and chicken an amazing crispy, crunchy coating, and it also adds texture to any gratin or casserole. Panko style products are processed into flakes and not crumbs, are larger, crispier and lighter than the usual ones, and most importantly, they absorb less oil when deep-fried. 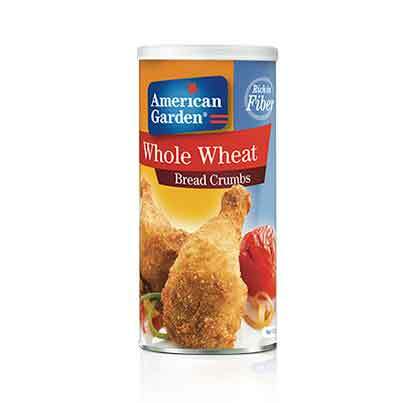 Add whole grains and fibers to your diet with American Gardens Whole Wheat Breadcrumbs. This versatile range offers a healthier alternative to white breadcrumbs as it is higher in fiber, vitamins B6 and E, magnesium, zinc, folic acid and chromium. 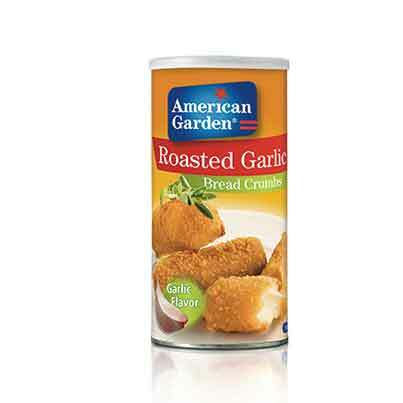 American Garden Roasted Garlic Breadcrumbs add a nice twist to your favorite breaded foods. Enjoy the same chicken tenders, mozzarella sticks and potato balls, with a delicious garlicky hint that will complement the original flavors without masking their naturally good taste. You can also sprinkle them on top of your potatoes and other baked dishes. Add an Italian twist to your breaded chicken by dipping your nuggets, drumsticks or wings in our delicious cheese-flavored breadcrumbs. 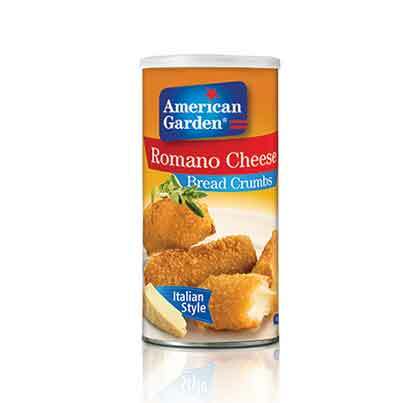 The mouthwatering cheese infusion in American Garden Romano cheese breadcrumbs will upgrade the taste of your all-time favorite fried foods, and it will keep your guests wondering about your new recipe secret! 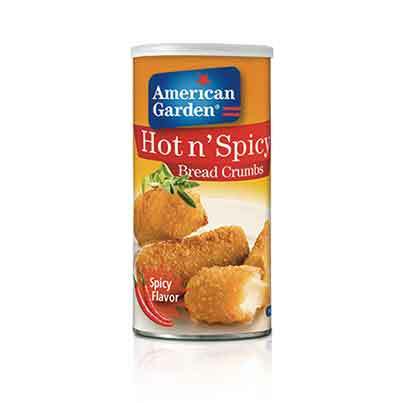 American Garden Hot N Spicy Bread Crumbs add a peppery flavor to your favorite foods. A perfect choice if you want to add a kick to your scalloped potatoes, mixed in your meatballs and burger patties, or when coating chicken and fish. 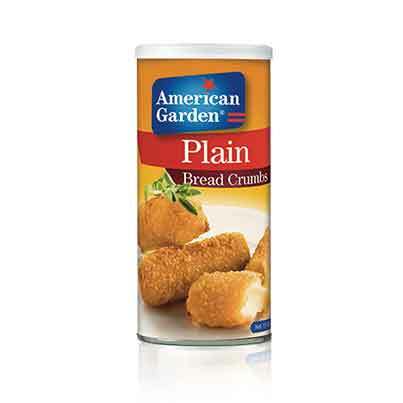 American Garden’s breadcrumbs offer a quick and easy way to prepare everyday favorites. 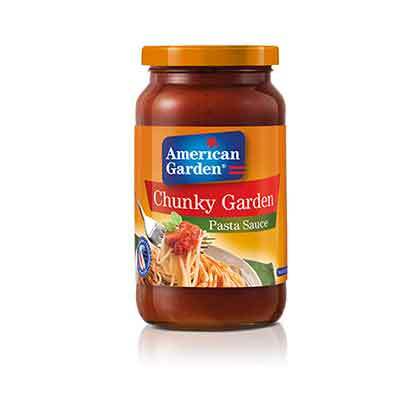 American Garden Chunky Garden Pasta Sauce is all you need to make your pasta dishes taste irresistible! Made from natural juicy tomatoes and spices, this sauce will make your spaghettis, macaroni and even lasagnas wholesome and delicious, while the vegetables chunks will add a nice crunchy texture. A time saver for everybody, all our sauces taste as fresh as homemade! 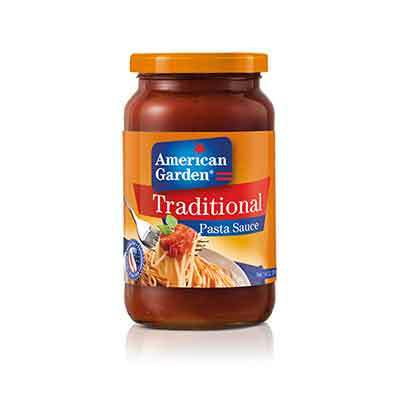 American Garden’s Traditional Pasta Sauce brings you the best Italian flavors with its delicious made-from-scratch taste! Juicy fresh tomatoes are carefully hand-picked to provide the base for a perfect balance of sweet tomato taste and savory herbs and spices. This simple and fresh stir-through sauce will instantly turn your spaghettis and penne into rich meals; it will also cut out the preparation time on your busiest days! 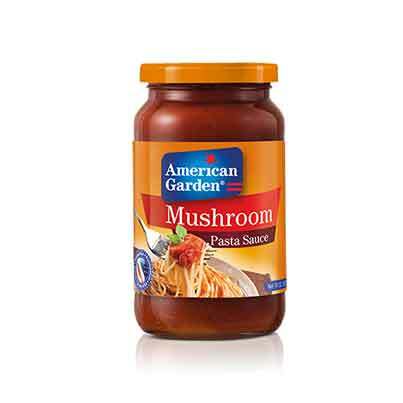 American Garden’s mushroom flavored pasta sauce will add a little taste of Italy to your dishes, the American way. Made of all-natural juicy tomatoes, mushrooms and a combination of exotic herbs and spices, it can make any pasta dish wholesome and delicious. Suitable for vegetarians as well, it is perfect for busy days and last-minute dinners. 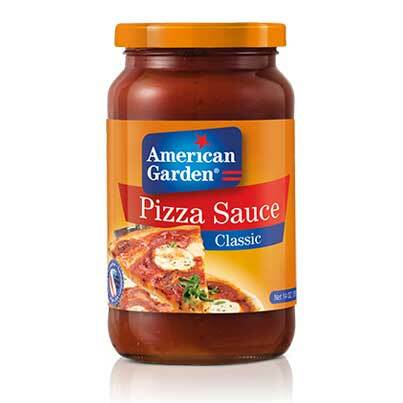 American Garden’s Pizza Sauce is a must-try for all pizza lovers. Made of natural red vine-ripened tomatoes and an exotic combination of herbs, our American pizza sauce just tastes like homemade, and it’s oh-so convenient! Just spread it over your dough base, top with cheese and bake in a hot oven! Perfect for family dinners, friends’ gathering or even movie nights. 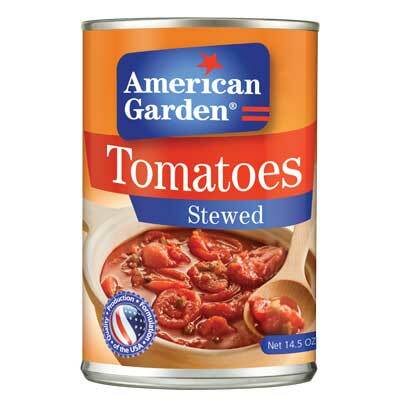 American Garden Stewed Tomatoes bring hearty flavor to your favorite family recipes! The best vine-ripened tomatoes are slowly simmered and seasoned with onions, celery and green peppers before they are canned to prepare this all-time favorite product. Enhance your soups, meals and stews without compromising the fresh tomato taste! 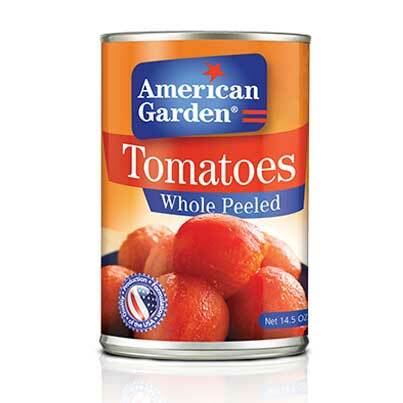 American Garden Whole Peeled tomatoes use the best vine-ripened fruits to get a nutritious yet tasty result. Perfect for adding a fresh tomato taste to your soups, stews, and pasta sauces, they are the best timesaver for busy moms. Always keep them at hand for last-minute lunches or quick dinner ideas! 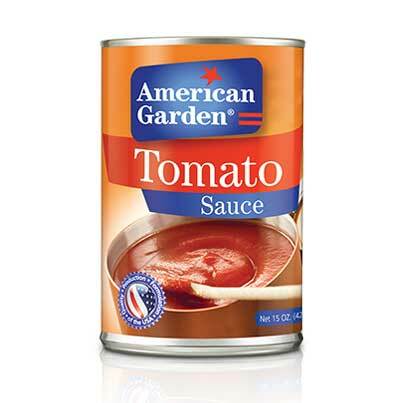 American Garden Tomato Sauce is prepared with the best vine-ripened tomatoes and flavored with garlic, onion and both green and red peppers. This ready-made American Tomato sauce is ideal for 5-minute dinners! Just toss your pasta into it, or spread it on top of your pizza dough. And if you’ve got some more time, we recommend you try it as a base for beef and lamb stews and casseroles, or on top of your meatballs, kebabs, chicken steaks and fish fillets. 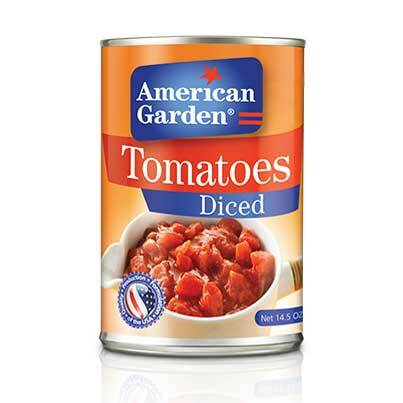 A kitchen essential, American Garden Canned Diced Tomatoes are made with natural vine-ripened tomatoes for a wholesome, authentic taste. Ready to stir in your favorite soups, stews and pastas, these tomato chunks add crispness to your dishes and are considered as an excellent timesaver. 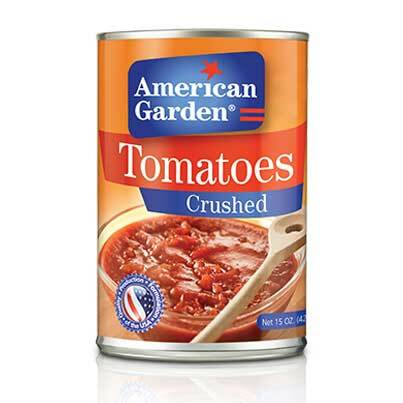 A high-quality product made from the best vine-ripened tomatoes, American Garden crushed tomatoes are perfect to use in your stews, soups and casseroles. They add a pulpy texture to your pasta and meat sauces as well, so you’d want to keep a few cans in your pantry for your everyday-cooking! 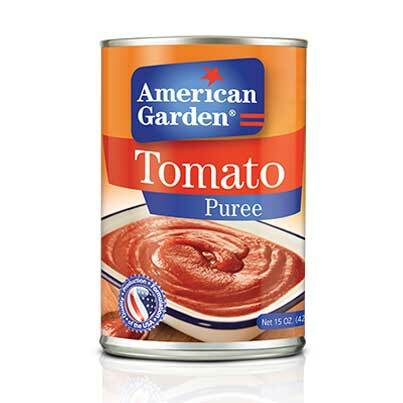 American Garden Canned tomato puree is made with natural vine-ripened tomatoes for a wholesome authentic taste. A kitchen essential, this product allows you to whip up any dish of your choice at a moment’s notice! Preparing all your traditional stews and curries, your favorite soups and hearty pasta or pizza sauces were never this easy. Coconut Cream is commonly used in Indian and Thai cuisines to prepare curries and soups. It’s also delicious in desserts and sweet dishes such as pies and puddings. 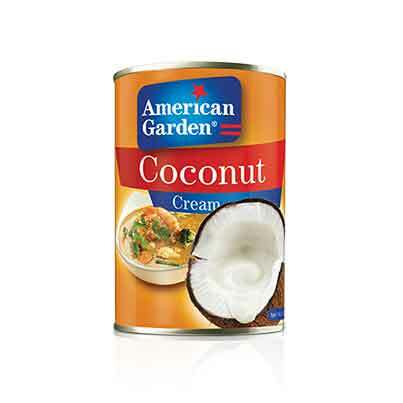 American Garden Coconut Cream is a quality product that guarantees a rich and flavorful taste every time. Four parts of shredded coconut to one part milk, it is thicker than coconut milk, but can also easily be diluted with milk to give it a lighter consistency. 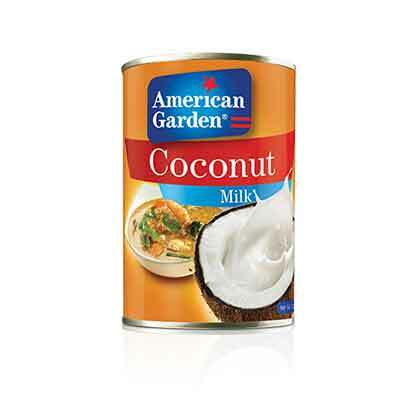 A key ingredient in curries and rich soups, American Garden coconut milk is full of flavor and a convenient cooking option for any housewife. It adds sweetness, richness, smoothness and luxury to any average meal it touches, especially sauces, rice and curries. Oh and did you know? This pantry staple can be used in sweet dishes and drinks too! 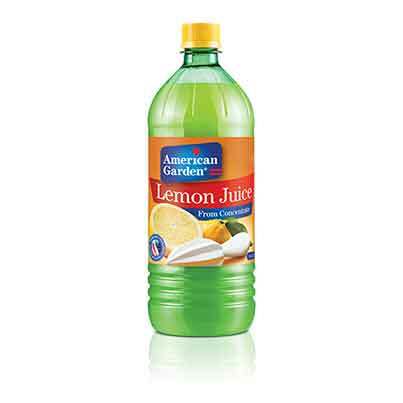 Made with 100% pure concentrated lemon juice, American Garden Lemon Juice has become number 1 product of its kind carrying with it the perfect acidity balance for any recipe. Pour it directly over your raw vegetables like carrots and cucumbers, add it to your favorite salads’ dressings or use it in your marinades for delicious grilled and roasted meats. It can even be used in preparing the most delicious desserts. Easy to pour, it has a long shelf life. American Garden Apple Cider Vinegar is made with 100% natural products and has no synthetic food additives, unlike many competing products, to guarantee the best taste to the consumer. 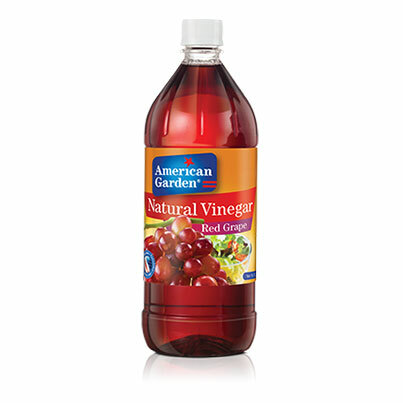 Made with 100% natural fruits, our American Garden red grape vinegar has become one of our greatest hits. Perfect to add to your dressings and marinades, it will give your mallow stew a unique taste. Famous for its disinfectant and antiseptic qualities, red grape vinegar can help you get rid of eggs smell in cakes and desserts as well. 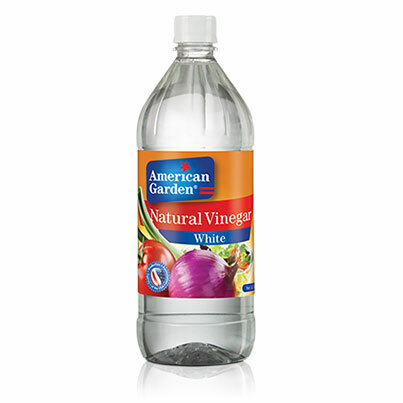 American Garden white vinegar is natural and stands out because of its ideal taste profile that will take your homemade pickles and salad dressings to the next level. 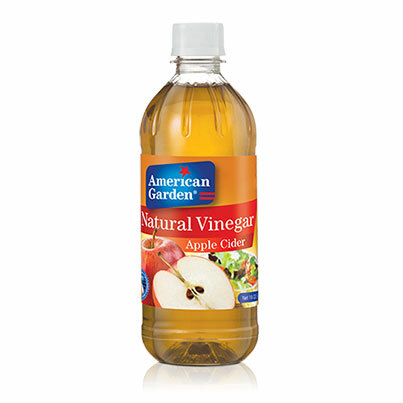 Natural Vinegar has antiseptic and disinfectant qualities that significantly extend its uses. Do not hesitate to add it to your vegetables while cleaning them to kill the germs or with the eggs to avoid their bad smell in your kitchen! 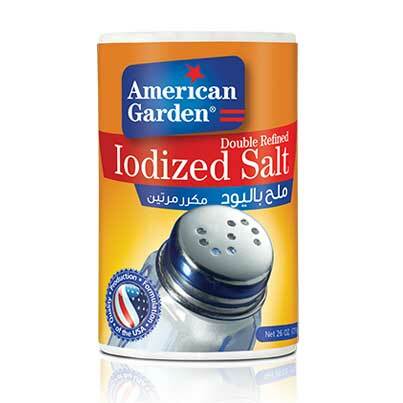 American Garden’s Salt is 100% iodized, double refined, and also stronger in taste, which means a little pinch goes a long way for all your savory recipes! Our product is packed in a dispenser, making it easy to use in all your favorite dishes! While many cooks believe that it is enough to sprinkle some tenderizer powder over meat, we recommend you start by piercing each side of the slice with a fork or knife all over then coating this side with the tenderizer. Sprinkle on some liquid – fruit juice, Worcestershire sauce, soy sauce, teriyaki or vinegar – to help the powder reach the inside of the meat. When you’ve treated one side of the meat, turn it over and repeat the process with the other side. The Meat Tenderizer should go through the entire cut to get the best results inside out. Using this meat softener will give an extra dimension to your meat. Your barbecue gatherings will get much better while following this tip. You can now enjoy juicy steaks and kebabs every time! Barbecue parties are just about to get better! 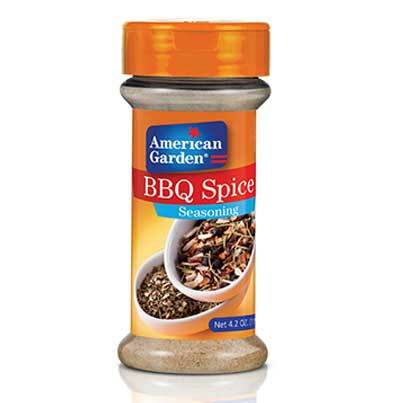 Discover American Garden BBQ Spice, a special blend of the highest quality spices that will make all your grill recipes taste so much better. 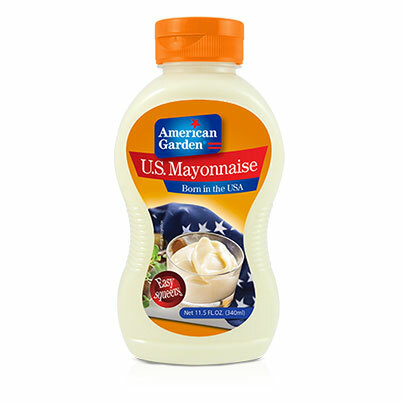 Not only will it add a unique flavor to your kebab, kofta, chicken and steaks, but it will also make your grilled veggies irresistible, the American style! 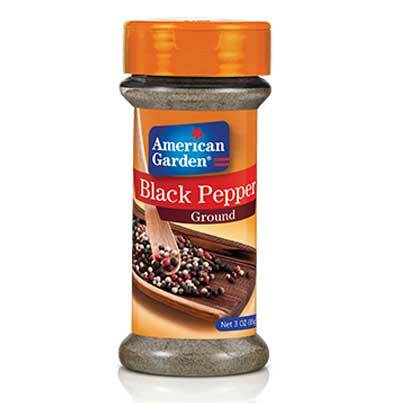 What’s better than American Garden Ground Black Pepper to enhance the taste of all your savory dishes? Freshly grounded from the best quality peppercorns, it will add a unique pungent flavor and sharp aroma to your favorite recipes! 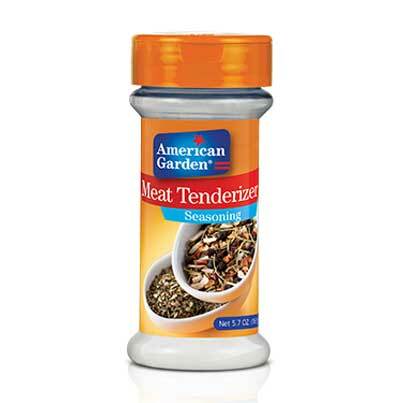 Sprinkle on your sauteed vegetables, baked potatoes, stewed meats and roasted chicken dishes for the ultimate taste! 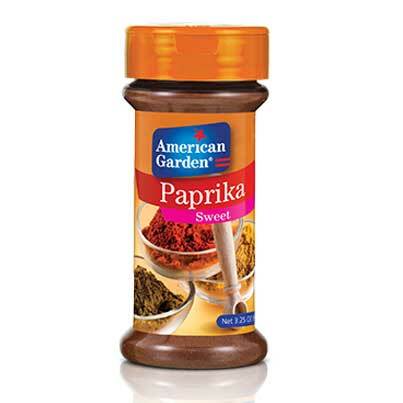 American Garden sweet paprika will not only add an exquisite taste to your dishes, but it will also make them more colorful! Sprinkle a dash of paprika on your favorite appetizers such as potato wedges, hummus and baba ghanoush to garnish them and boost their flavors! Rich in taste, this product will definitely make your meals more appealing! 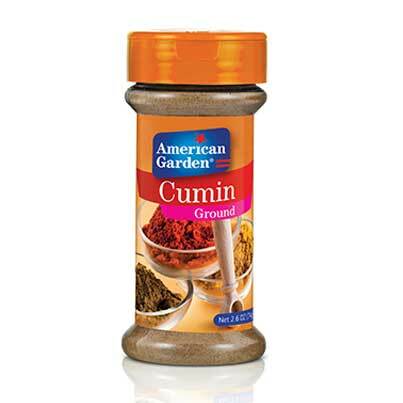 American Garden offers you the best quality cumin, ground to your convenience, to accompany you in your ultimate cooking experience! Also known for its health benefits, and largely used in Mediterranean and Asian cuisines, it adds an earthy and warming feeling to your traditional recipes such as fatteh, kofta, curries and lentil soups. 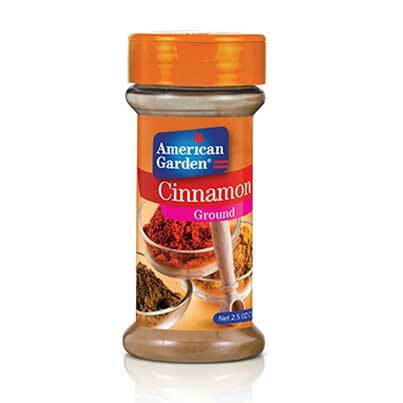 American Garden offers you the best cinnamon quality for endless cooking adventures. Widely used in Arabic and Asian cuisines, cinnamon is an essential ingredient in many basic spices mixtures (masala, curry, biryani…). But its use is not limited to savory dishes only! 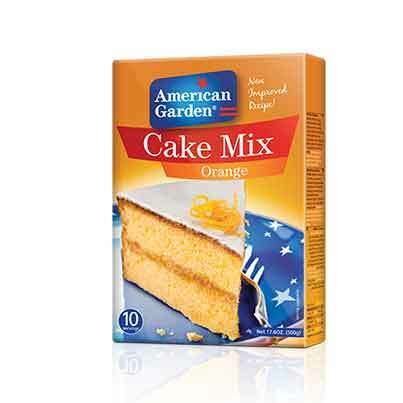 You can add it to cake batters, sprinkle it on apple pies, rice and milk puddings as well as on famous salep drink. 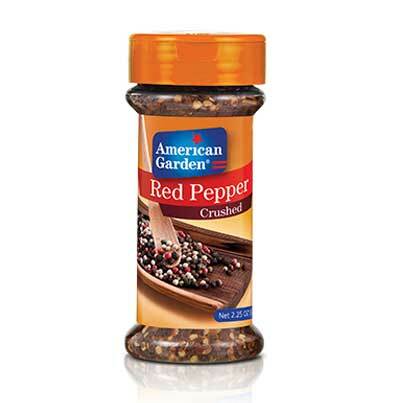 Spice up your daily homemade dishes by adding a pinch or two of our American Garden Crushed Red pepper. Perfect in all tomato-based sauces such as pizza and pasta, this condiment can also be used to season meatballs and potato wedges, or to add a zing to your dips and marinades. 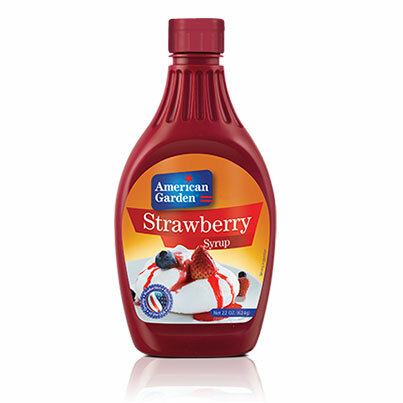 Our strawberry syrup adds a hint of sweetness and freshness when drizzled over any dessert! Use this delectable product to upgrade your old-fashioned sundaes and your average milkshakes or ice creams. And what about trying it as a topping for your pancakes, waffles or crepes? 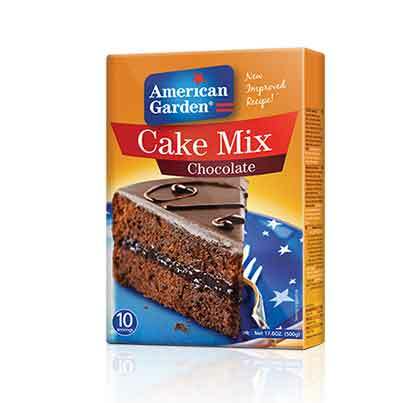 If you, like us, think there’s never too much chocolate, then this product is for you. 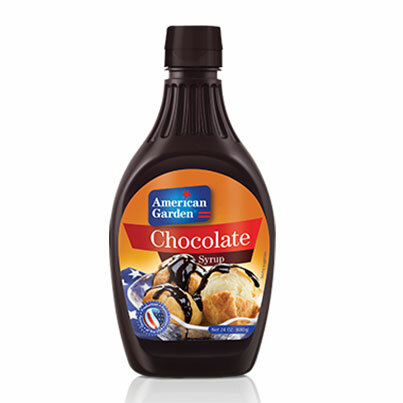 Discover American Garden’s rich chocolate syrup and enjoy it drizzled over your favorite desserts: sundaes, ice creams and cakes never tasted that good. Our little tip: try to pair it with whipped cream whenever adding it to your desserts… it’s lip-smacking! 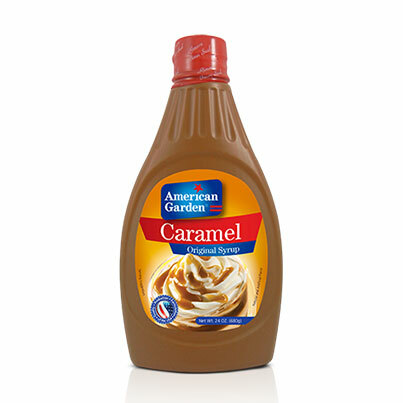 To start your day on a sweet note, try drizzling your pancakes and crepes with American Garden’s Caramel Syrup. We guarantee that all you family will love it. A cherry on top is the perfect finishing touch to anything sweet. 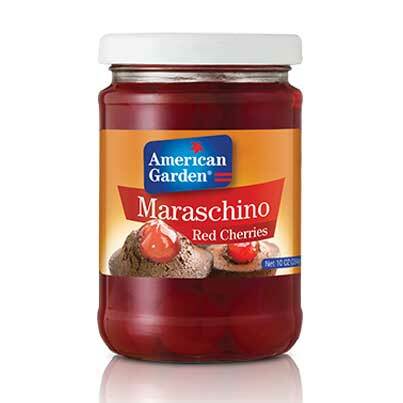 The succulent American Garden Maraschino cherries is the perfect topping for your cake, ice cream sundae, milkshake or a refreshing summer mocktail. Everything tastes better with the sweet sensation of American Garden toppings and fillings. Add a can of strawberry topping and filling to your smoothie for a sensational and refreshing drink. 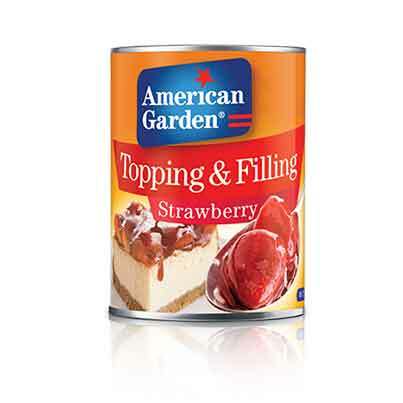 Strawberry trifle, shortcake , parfait or crepe, pop open a can of American Garden Apple topping and filling and explore all the delicious treats you can make with this versatile product. 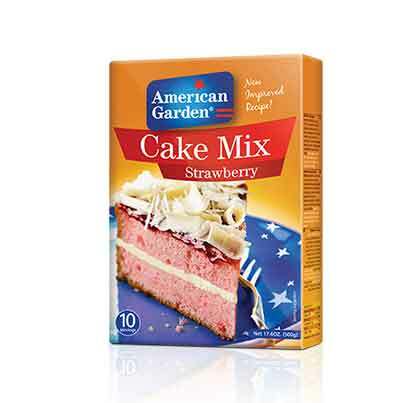 Liven up any sweet creation with the help of American Garden toppings and fillings. Pour a luscious layer of cherry topping and filling between 2 layers of vanilla cake to instantly make an easy irresistible dessert. 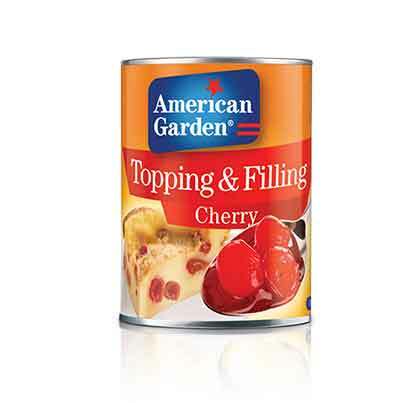 Cherry trifle, Cake, pie or crisp, pop open a can of American Garden Cherry topping and filling and explore all the delicious treats you can make with this versatile product. Perfectly sweetened and available all year around American Garden toppings and fillings are great to satisfy any sweet craving. 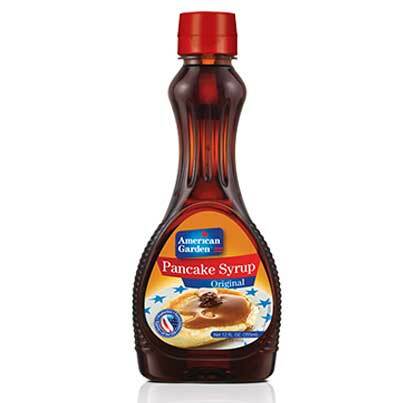 Mix in a half a cup of blueberry topping and filling to your favorite pancake recipe for a new brunch favorite. Your loved ones are always going to want another helping of the delicious blueberry pancakes that only take you minutes to make. 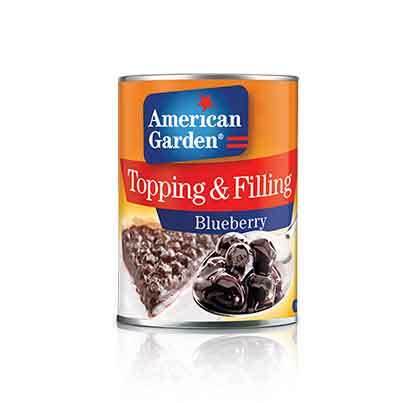 Blueberry muffins, cheesecake, crumble or tartlets, pop open a can of American Garden Blueberry topping and filling and explore all the delicious treats you can make with this versatile product. Apple pie, is a classic dessert that dates back to the 18th century. 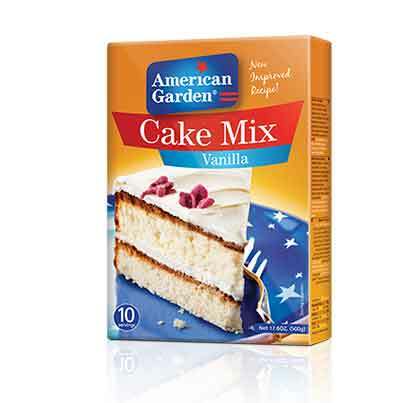 You can easily make this dessert within minutes with the help of American Garden. Just add a splash of cinnamon to the perfectly sweetened Apple Filling and bake in a pie crust. Serve each slice of warm apple pie with a scoop of vanilla ice cream for a delectable dessert that’s been enjoyed for centuries! 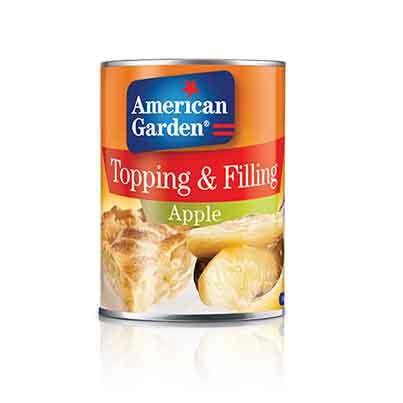 Apple muffins, Cake, crisp or tarts, pop open a can of American Garden Apple topping and filling and explore all the delicious treats you can make with this versatile product. Our newest flavor addition to the American Garden family is the delectable Sea salt & Black Pepper popcorn. Crunchy and salty with a peppery zing, this popcorn flavor is guaranteed to be a hit at your next gathering. 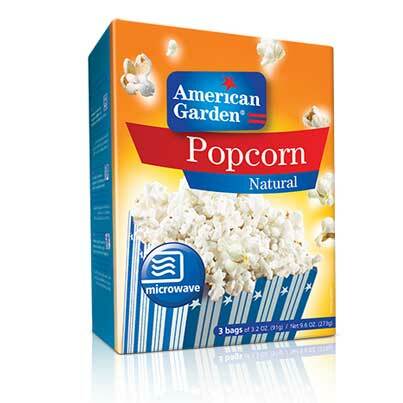 American Garden Natural Microwave Popcorn delivers the ultimate combination of flavor and fun. 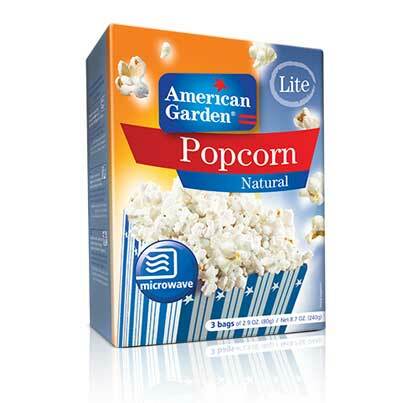 Perfect for movie nights in, chick-flicks or sci-fi, every movie is made great with salty hands full of warm Popcorn. 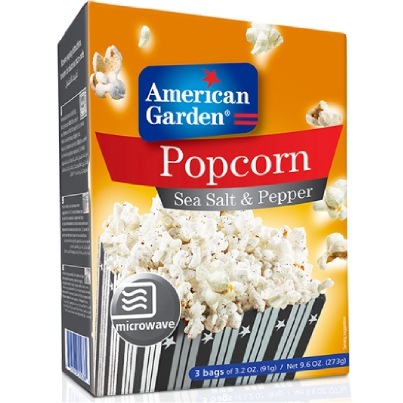 American Garden Popcorn delivers the ultimate combination of flavor and fun by combining Hot and Spicy together. 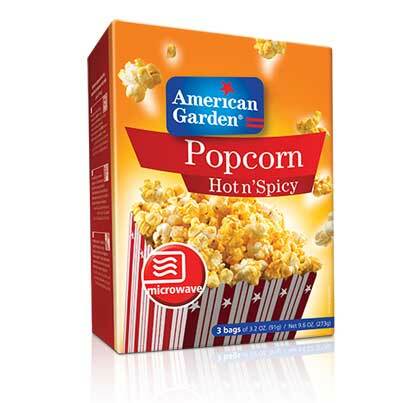 Spice things up with American Garden Hot n’ Spicy popcorn, it’s the perfect snack when you are looking for a little kick in your day! 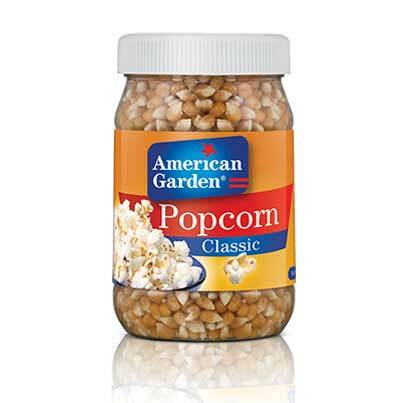 American Garden Popcorn delivers the ultimate combination of flavor and fun. A little extra love with added extra butter! Indulge in our microwaveable extra butter popcorn for a warm salty snack. 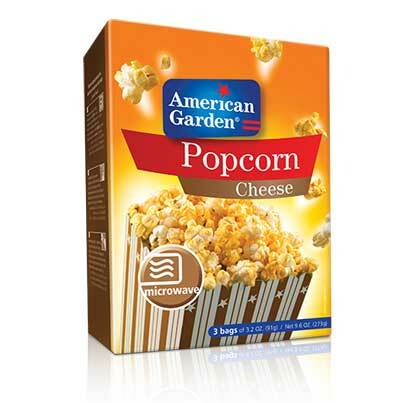 Pop some flavor into the show with our cheddar cheese microwaveable popcorn. Buttered popcorn is the classic movie theater favorite that you can now enjoy in the comfort of your own couch. 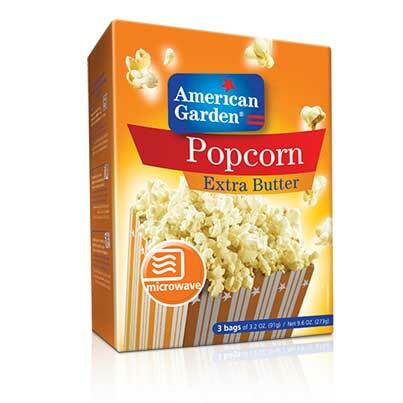 Make every movie night delicious with American Garden Butter flavored popcorn. If you’re looking for a healthier snack between meals then you’re in the right place. Popcorn is a light snack that’s high in fiber, making it highly effective for eliminating your hunger cravings without damaging your diet. 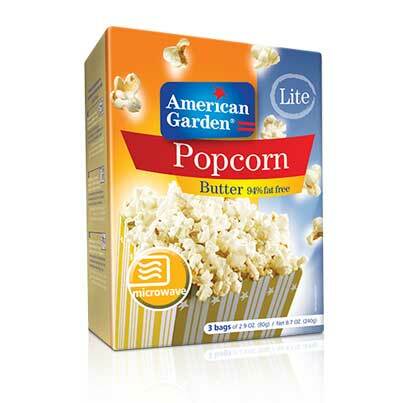 So, next time you’re looking for a pre-dinner snack, grab a bag of American Garden Natural Lite popcorn, you won’t regret it! In just three minutes you can dive into a bag of buttery goodness that is 94% fat free. 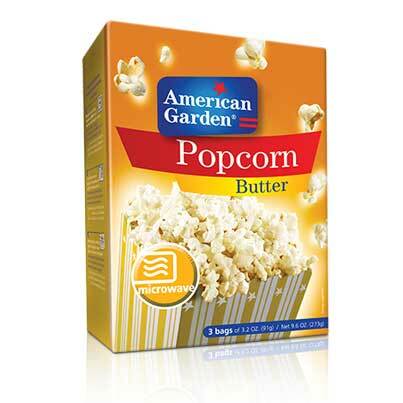 With American Garden Fat Free Buttered popcorn you can enjoy the classic movie theater flavor without the guilt. Sriracha, Za’atar or even S’mores Popcorn! With our classic popcorn there are no restrictions on the flavors you can add to your crunchy popcorn. Get creative and let your imagination run wild with American Garden gourmet popcorn kernels. 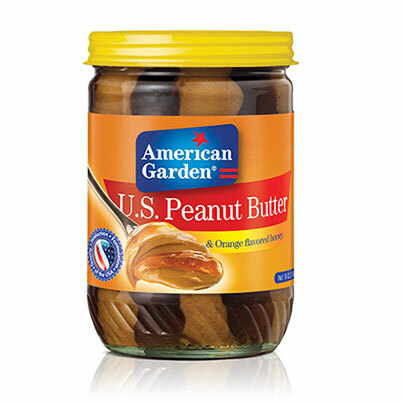 Peanut Butter is a classic childhood favorite that you never quite outgrow, and with American Garden Reduced Fat peanut butter you don’t have to. Indulge in your favorite childhood snack with all the flavor and 25% less fat. 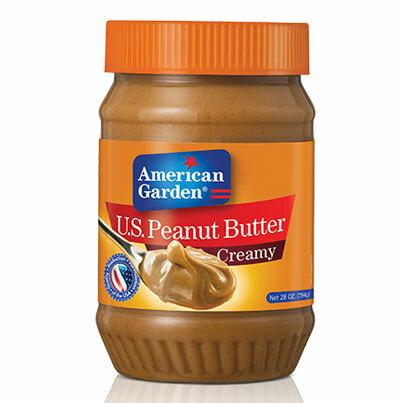 You can use American Garden peanut butter to make sandwiches, desserts, or to dip in your favorite fruits, the possibilities are endless with this deliciously creamy and nutty spread. We’re making a classic childhood favorite, even sweeter. Our flavored peanut butter starts off with our deliciously smooth and creamy peanut butter combined with a lip-smacking Strawberry Jelly flavor stripe. High in fiber and protein a classic peanut butter and jelly sandwich is great for a lunchbox or after school snack. For a refreshing twist on classic favorites try our peanut Butter and orange flavored honey. 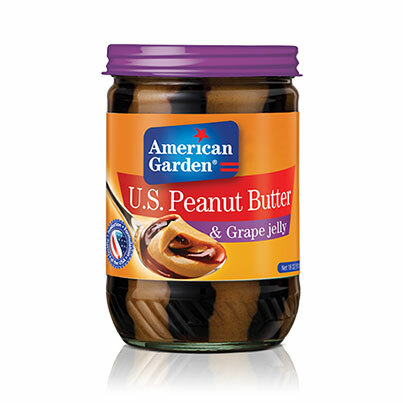 American Garden peanut butter and grape jelly is the perfect ingredient for a lunchbox sandwich. Our classic creamy peanut butter comes with a delectable grape jelly fruit stripe perfectly balancing the sweet and salty flavors. 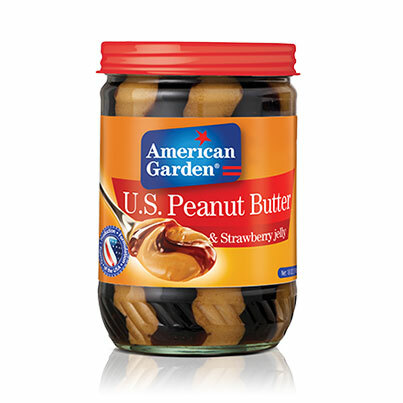 American Garden Peanut Butter and Jelly is great for first time peanut butter consumers. 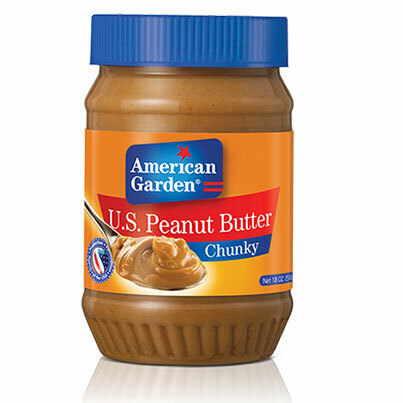 A childhood breakfast favorite, our peanut butter is well known for its authentic American taste. Our recipe has the perfect blend of nutty, sweet and salty flavors so whether you’re making a classic Peanut Butter sandwich, or spreading some on an apple, American Garden peanut butter is perfect way to enjoy your daily fiber and protein intake. Your favorite childhood lunchbox snack, our peanut butter is well known for its authentic American taste. Add a little extra crunch to your day with American Garden Chunky peanut butter, high in protein and naturally low in cholesterol. 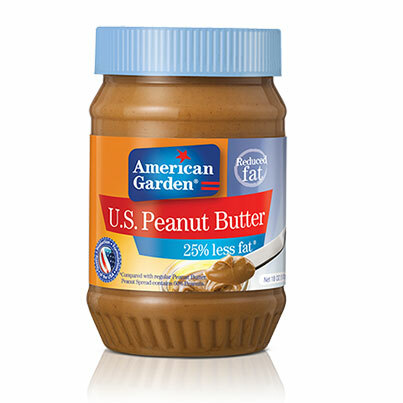 American Garden peanut butter is the perfect way to kick start a morning or to give yourself that afternoon boost.